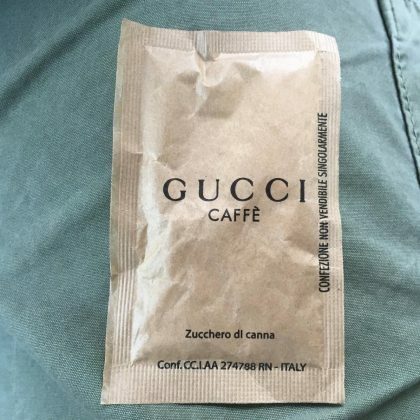 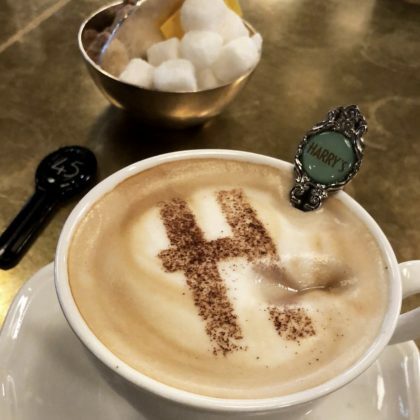 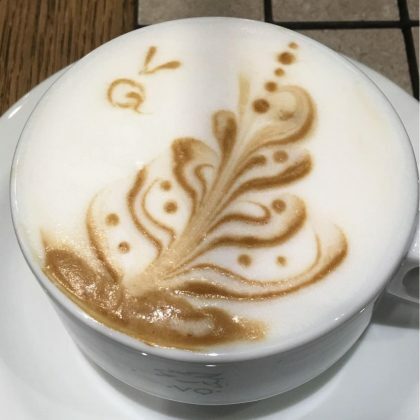 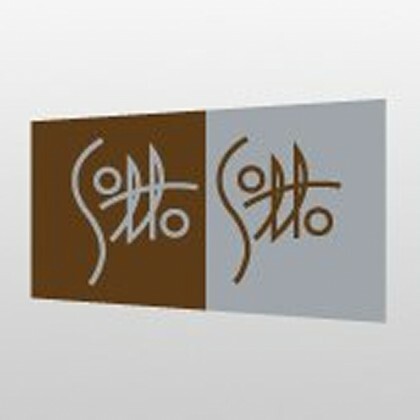 Jonathan Cheban had a coffee at London, England, UK’s Harry’s Dolce Vita in August 2018. 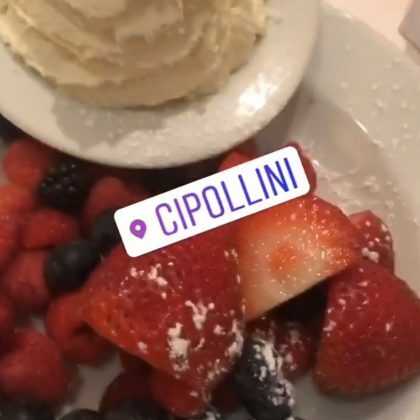 Pia Mia checked into New York City, NY, USA’s Il Tinello Italian restaurant in June 2018. 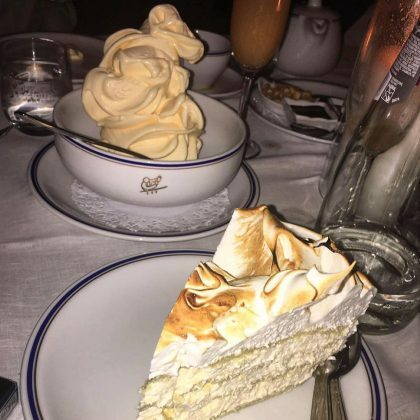 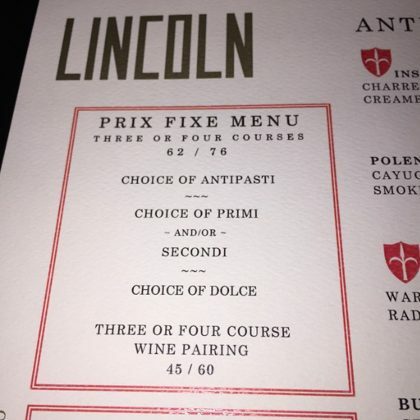 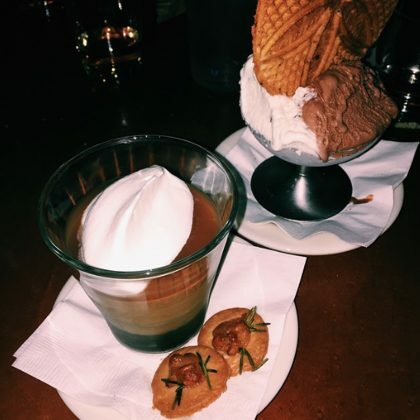 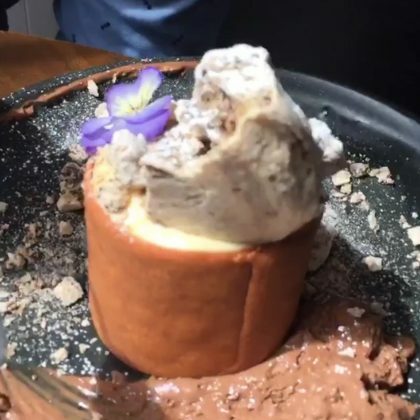 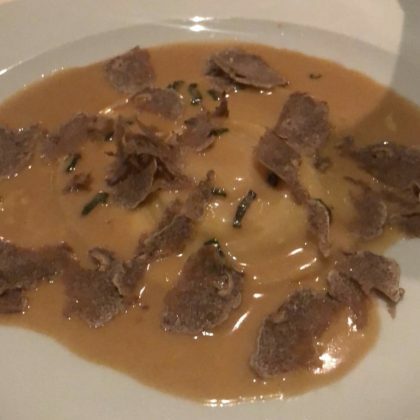 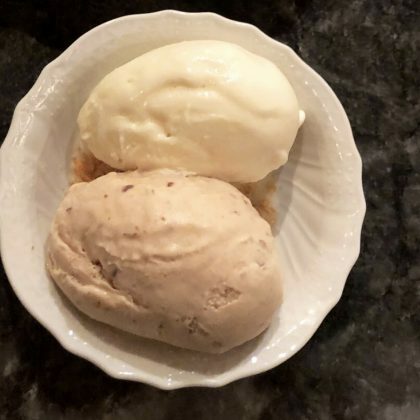 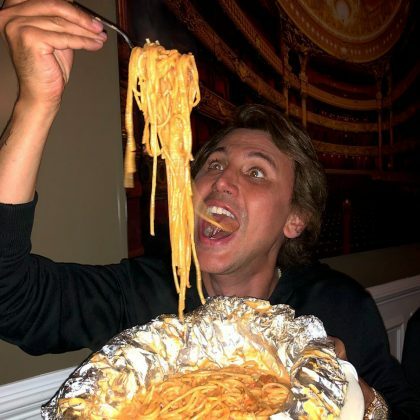 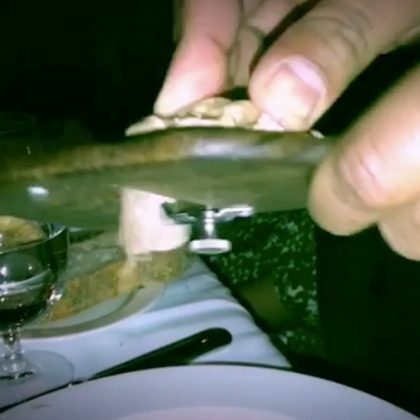 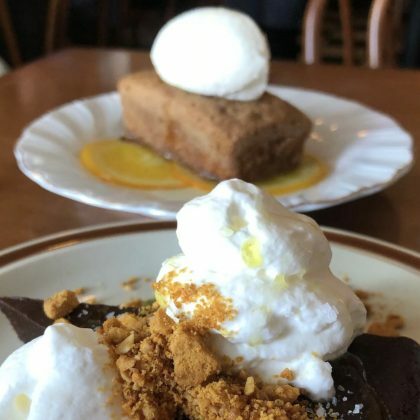 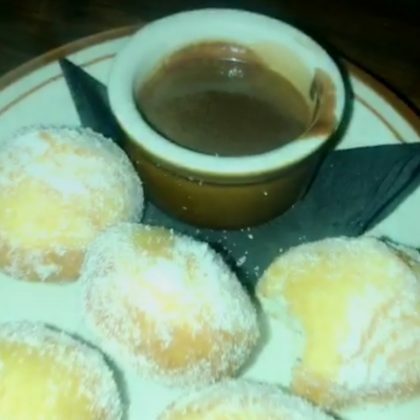 Jonathan Cheban ordered pasta and a chocolate-covered dessert while at Brooklyn, New York, NY, USA’s Cecconi’s Dumbo in June 2018. 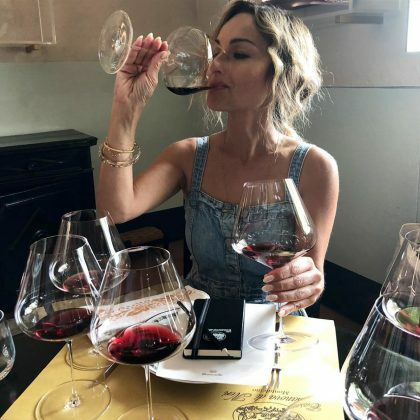 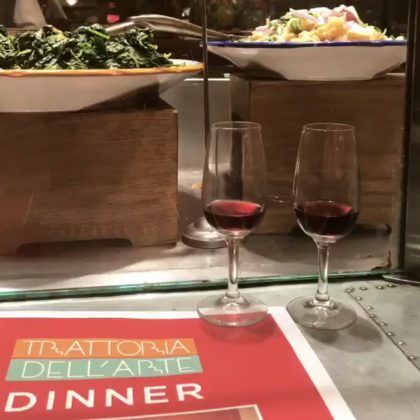 Whitney Port appeared to have a glass of red wine and “ate a Caesar salad” and “a quarter of a pizza” when she was at New York City, NY, USA’s Trattoria Della’Arte in June 2018. 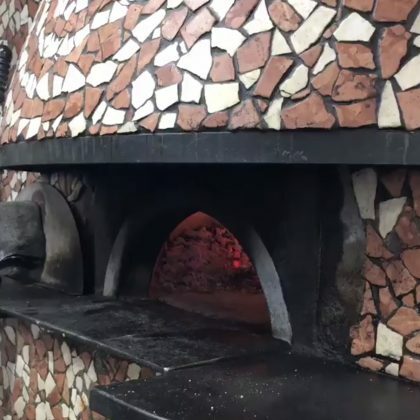 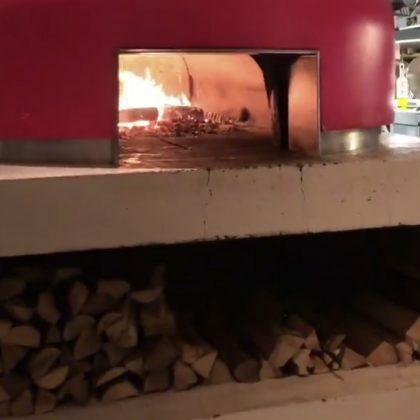 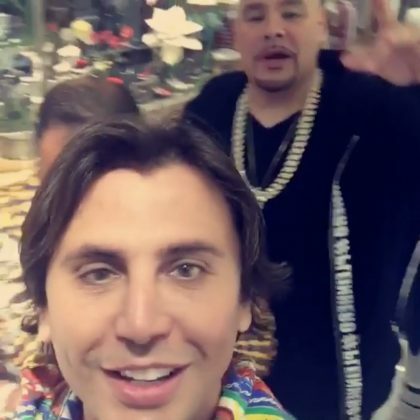 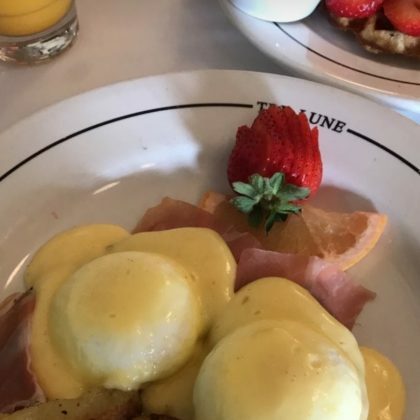 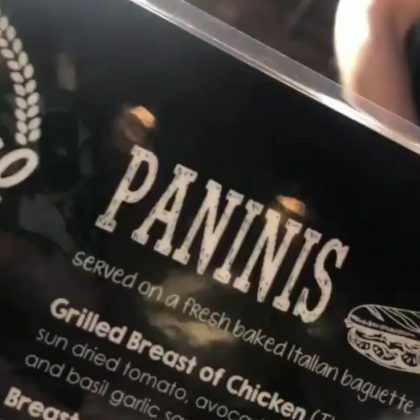 Jonathan Cheban checked out the panini offering at Il Tramezzino, Beverly Hills in May 2018. 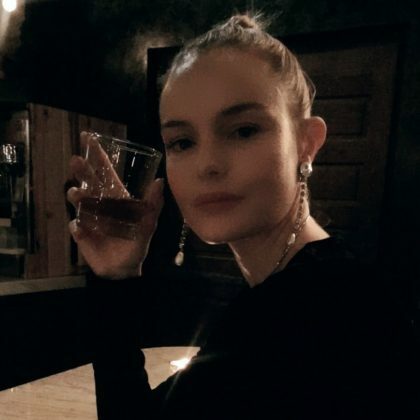 Kate Bosworth ate at the dimly-lit Forlini’s Italian restaurant in New York City, NY, USA in May 2018. 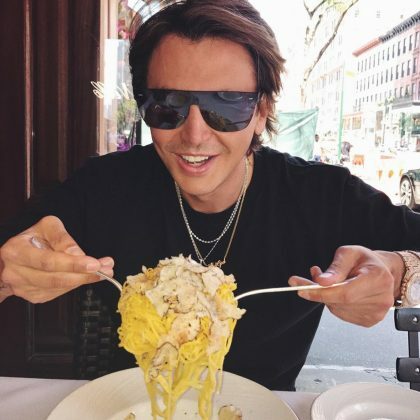 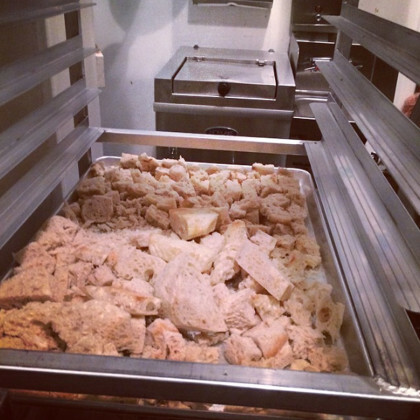 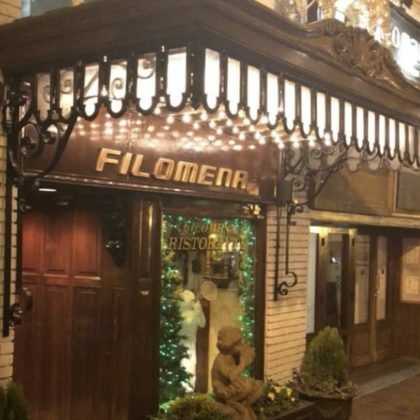 Calamari fritti was one of the dishes Jonathan Cheban ordered when he ate at Filomena Ristorante in December 2017. 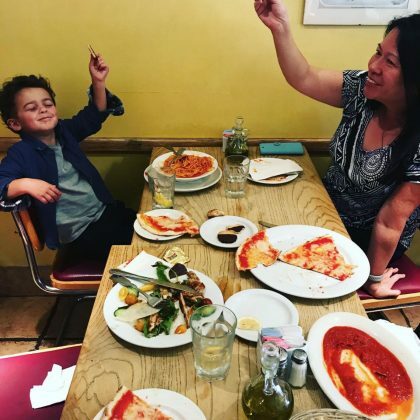 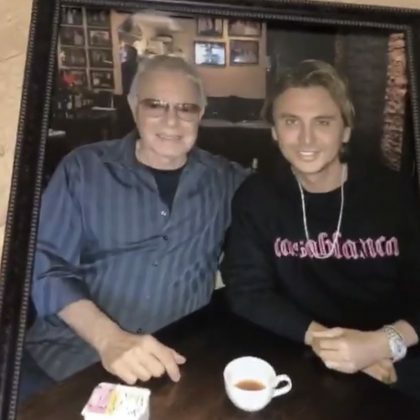 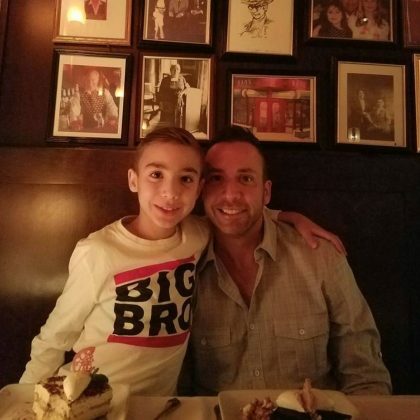 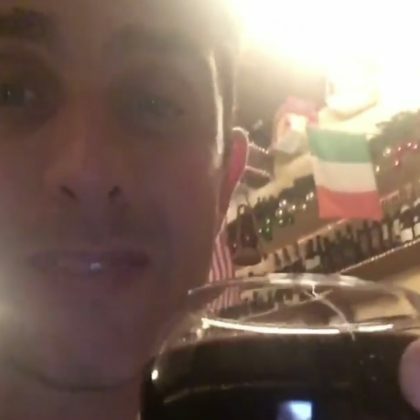 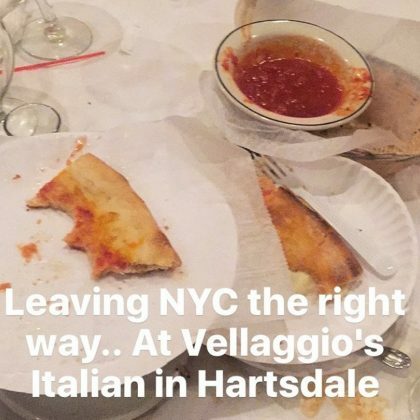 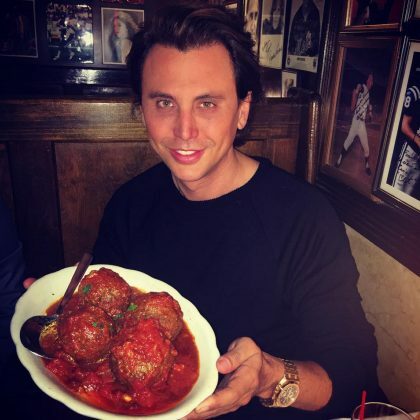 Jonathan Cheban checked in at Angelo’s of Mulberry Street for some Italian food in November 2017. 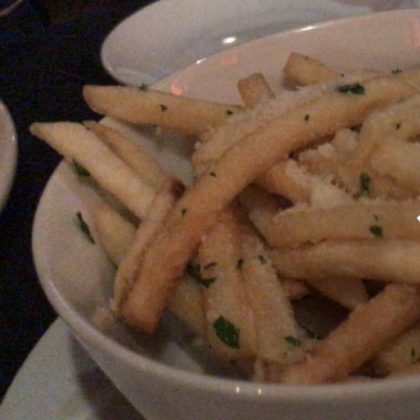 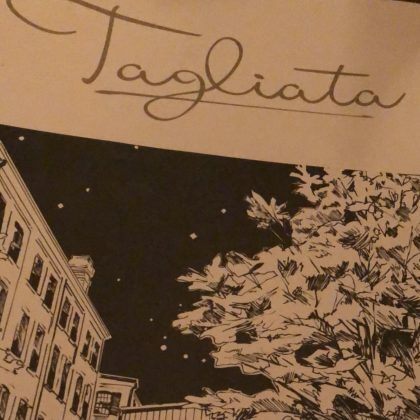 It was a “Truffle fries kind of night” for Lily Aldridge at Giovanni Ristorante West in November 2017. 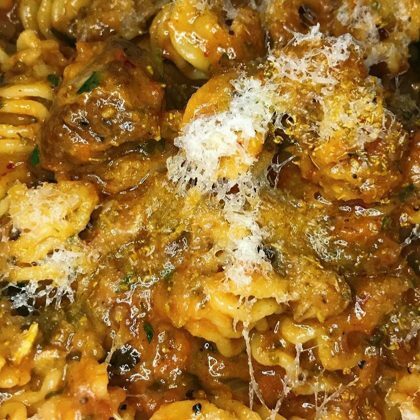 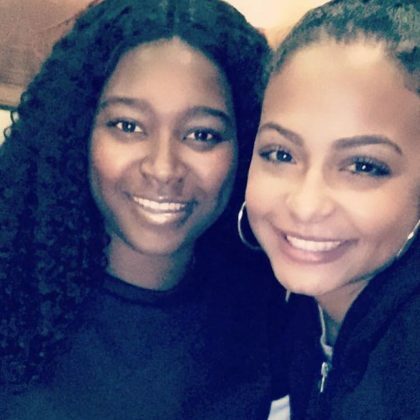 Christina Milian ordered a truffle-topped pasta dish at Nolita in October 2017. 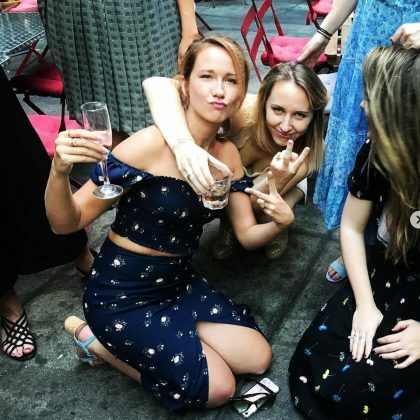 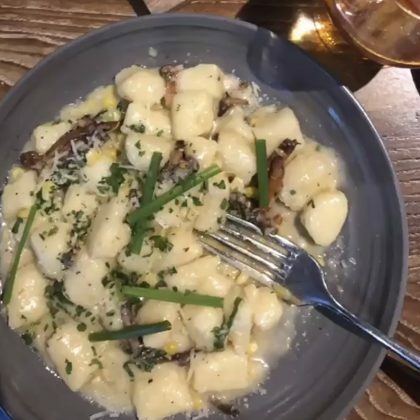 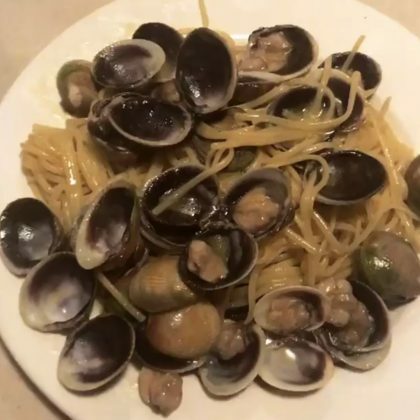 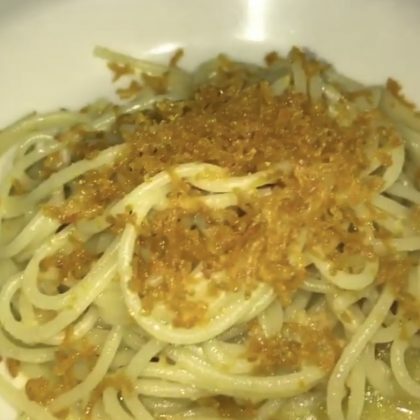 Billie Lourd ate pasta at Uovo in October 2017. 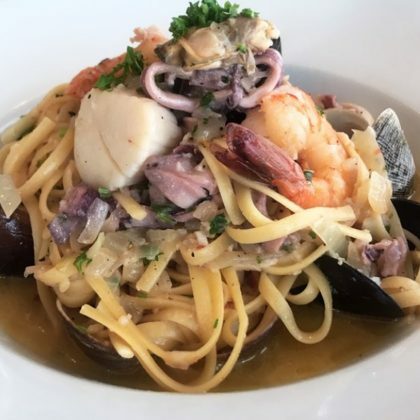 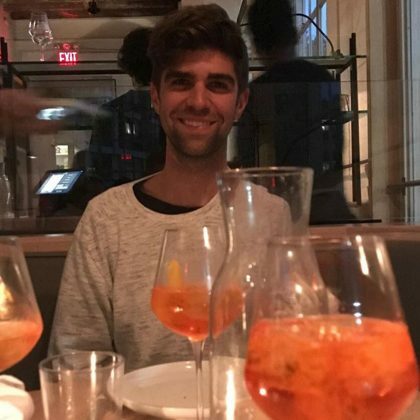 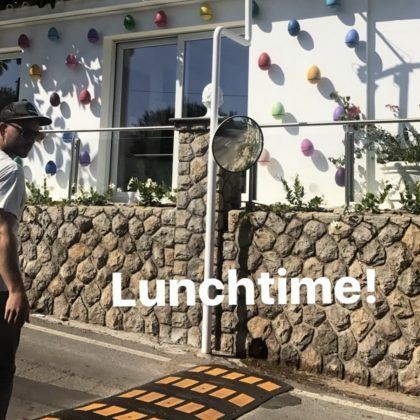 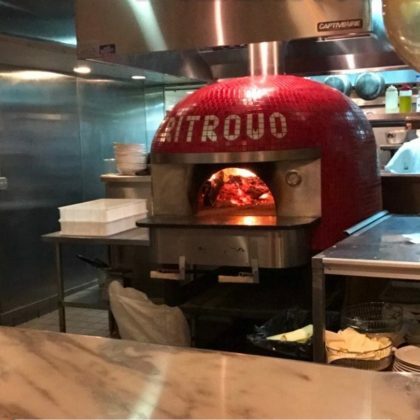 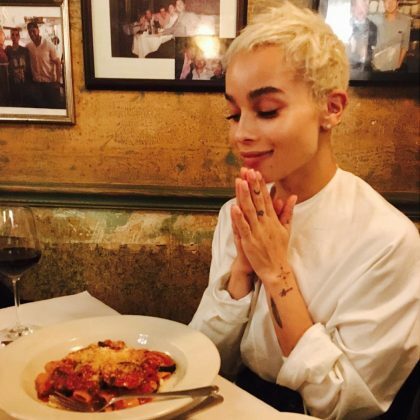 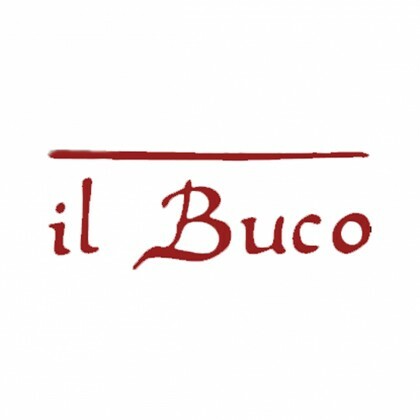 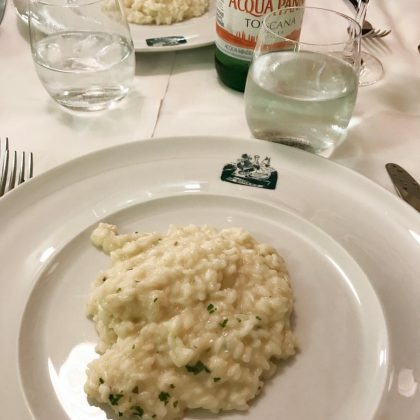 “Lunchtime!” is what Becca Tobin said when she ordered seafood, pasta, and pastries at Ristorante Quattro Passi in September 2017. 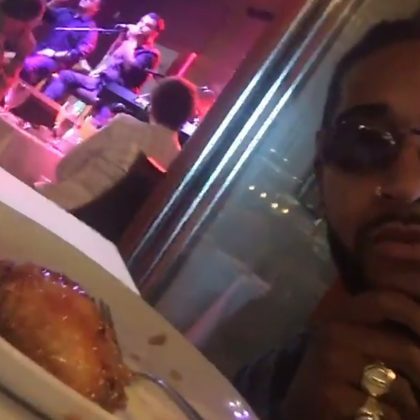 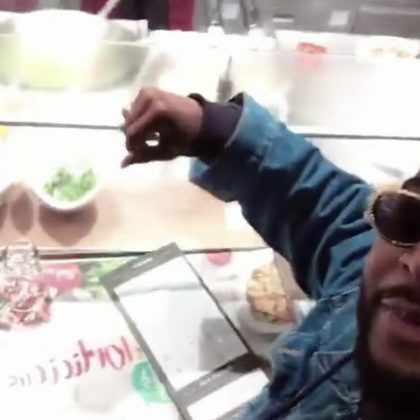 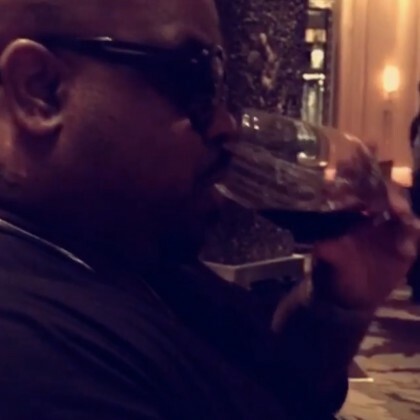 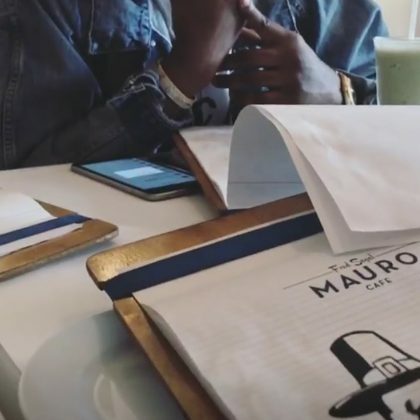 Omarion enjoyed live music while eating his meal at Spaghettini in September 2017. 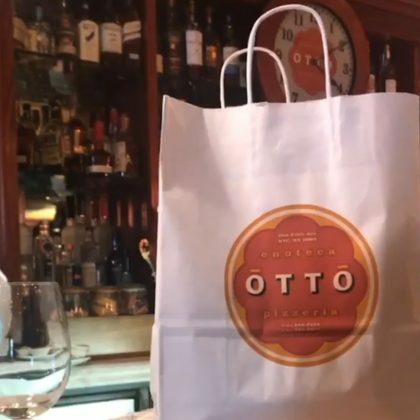 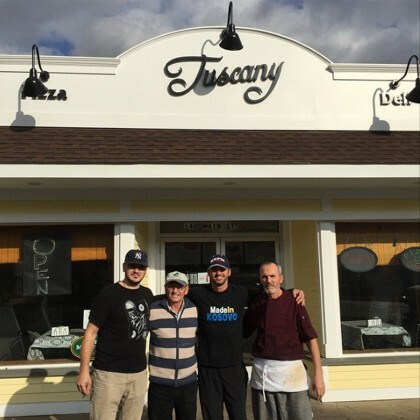 Tiffani Thiessen made a “Pit stop” to pick up some OTTO Enoteca e Pizzeria takeout in August 2017. 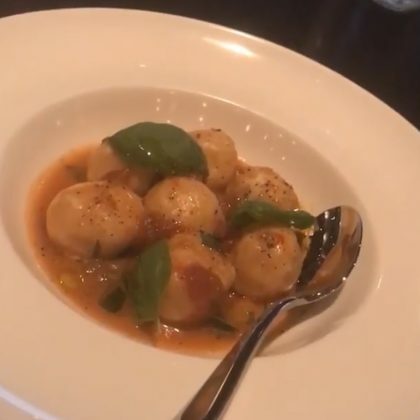 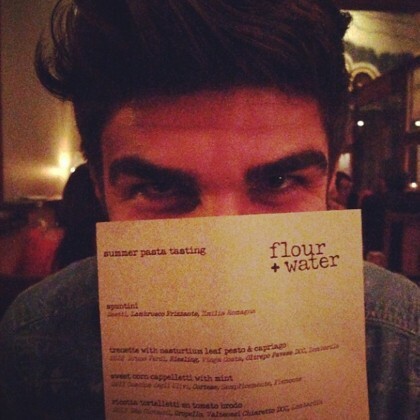 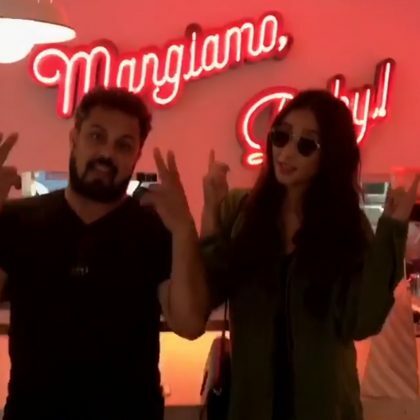 Shay Mitchell ate at The Sosta with friends in August 2017. 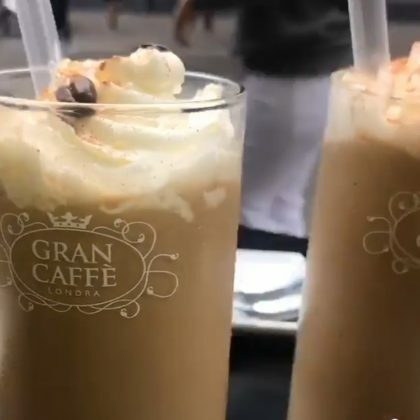 Jonathan Cheban sipped some iced coffee while sitting at a reserved table at Gran Caffé Londra in August 2017. 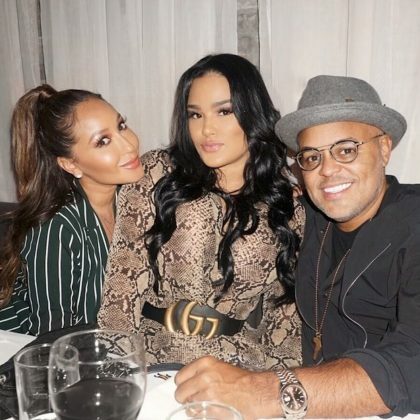 Adrienne Bailon toasted an August 2017 ” f a m i l y d i n n e r” with a glass of red wine at Giovanni Nashville. 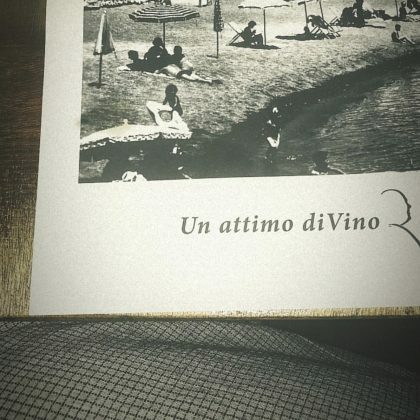 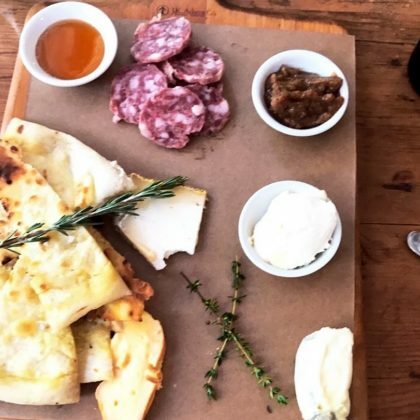 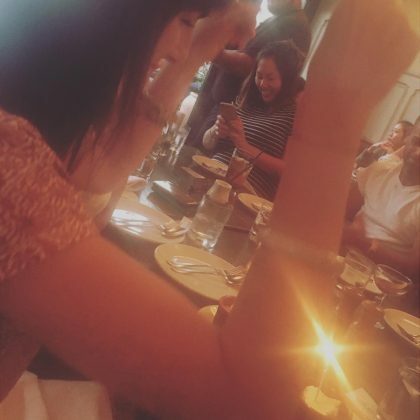 Shay Mitchell was all about the white wine and pasta she ordered at this Italian restaurant in July 2017. 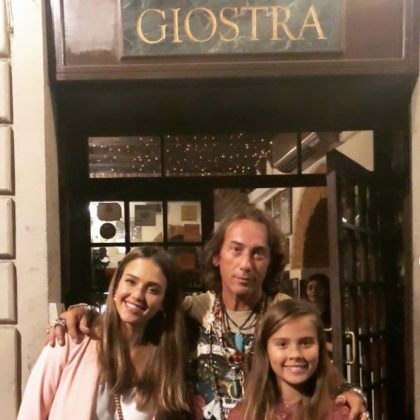 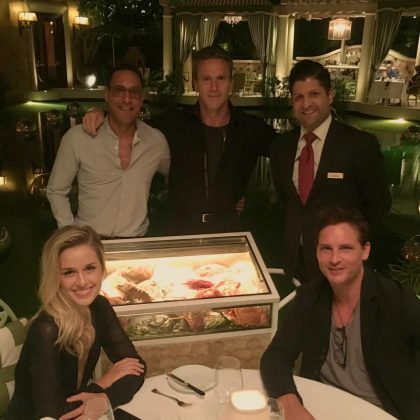 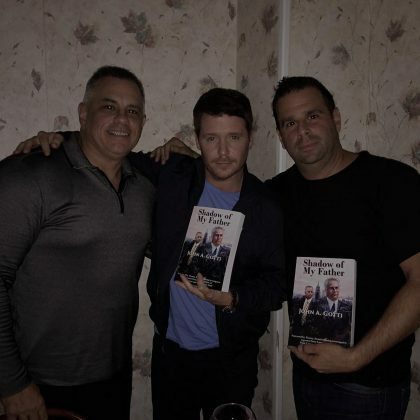 Peter Facinelli photographed his “#ThreeSisters” when he was checked in at La Nonna with them in July 2017. 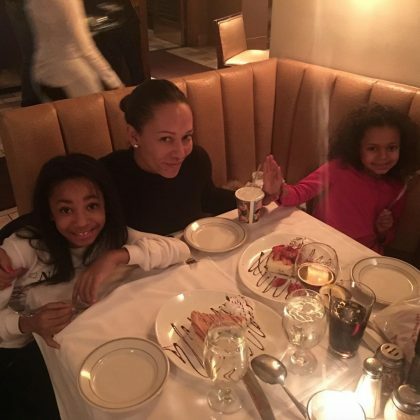 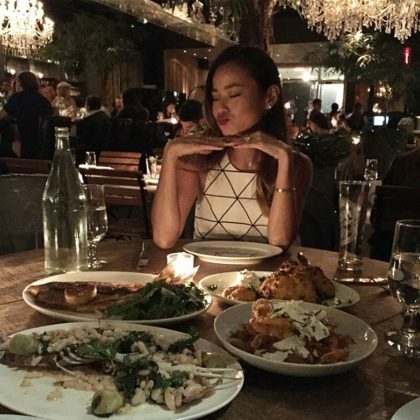 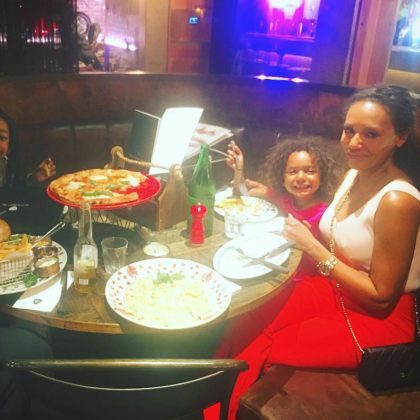 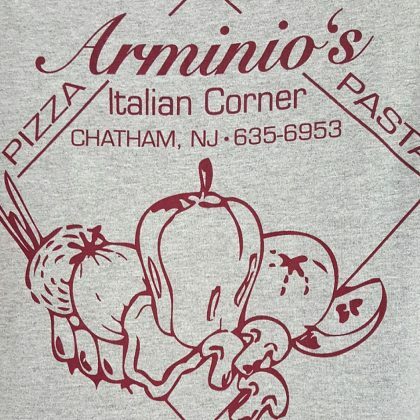 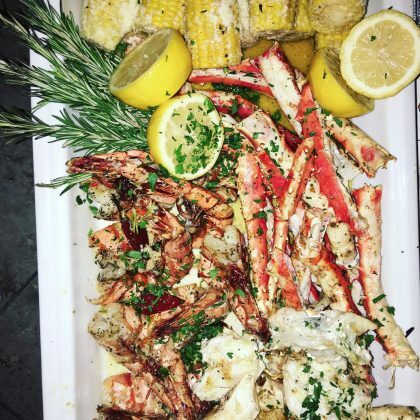 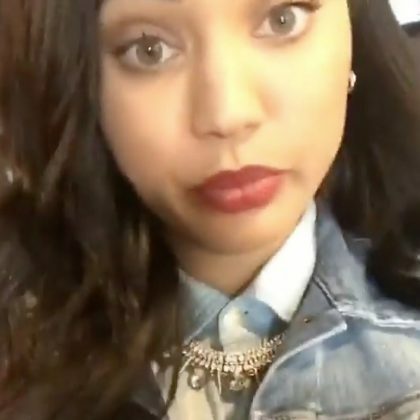 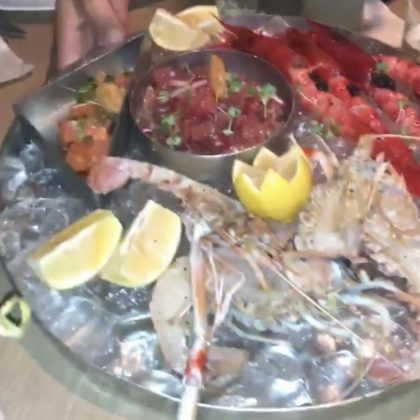 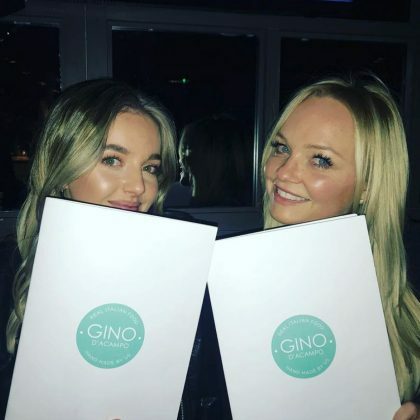 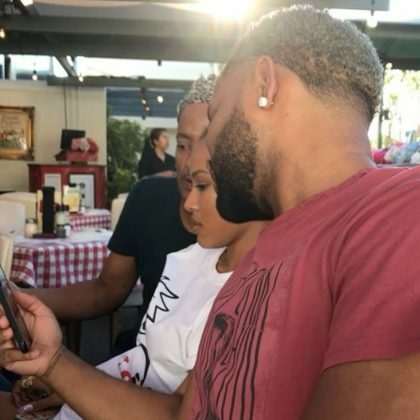 Karrueche Tran was one of Christina Milian’s friends who attended a meal with her here in June 2017 — Christina ordered the grilled mixed seafood and spaghetti dish. 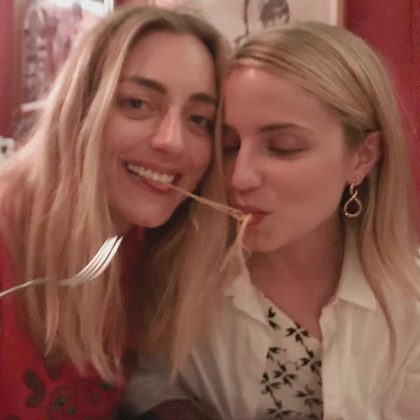 “Sharing is caring” is what Dianna Agron said when she pulled a Lady and the Tramp-style spaghetti move with a friend here in June 2017. 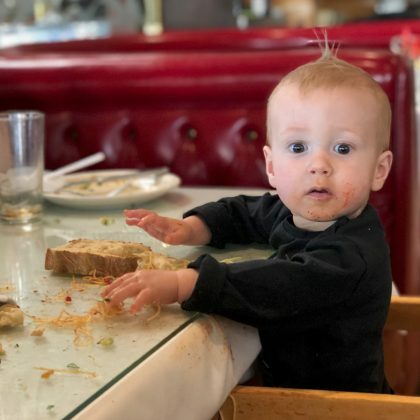 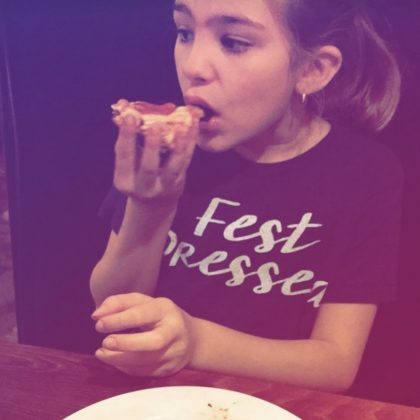 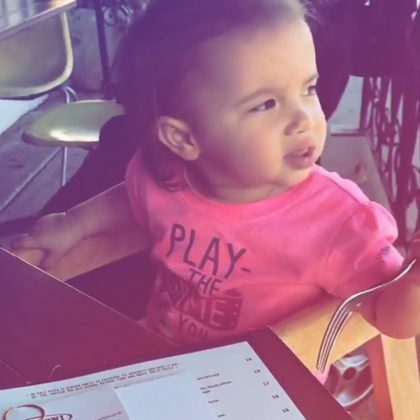 Jana Kramer brought her daughter to Terroni for a meal with friends in June 2017. 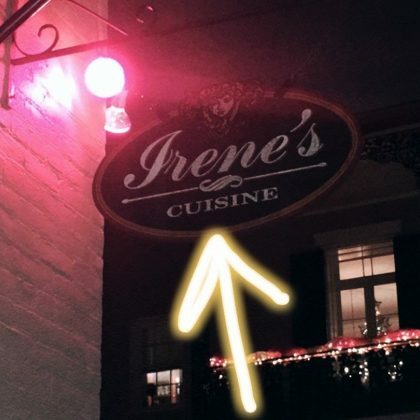 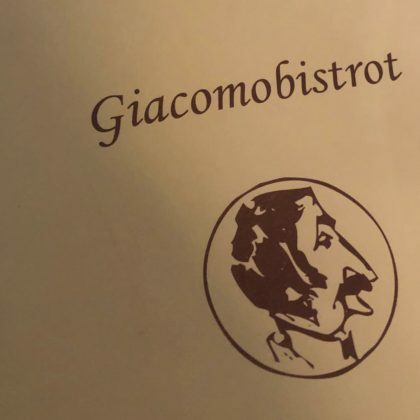 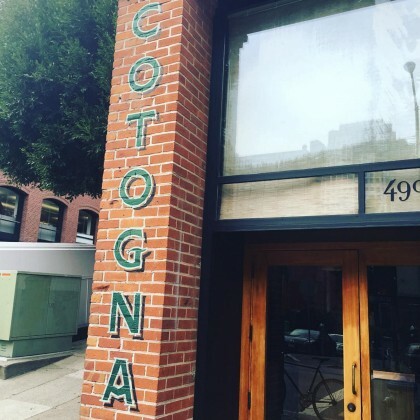 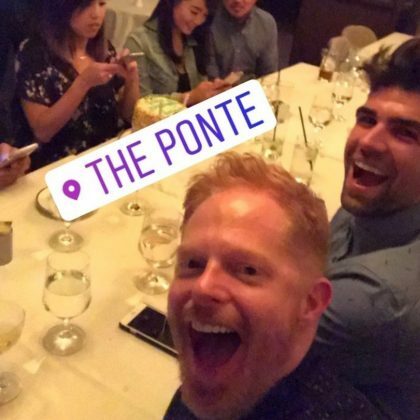 Jesse Tyler Ferguson ate pasta here with “My favorite” — Justin Mikita — in June 2017. 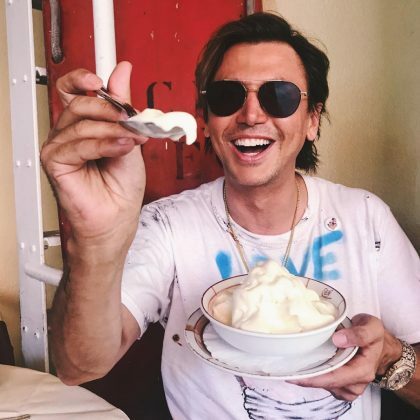 On a 90-degree day in June 2017, Jonathan Cheban made a “quick stop at Cipriani for a little Bellini, little spritzer,” and some “cold delicious creamy home made vanilla ice cream” — a couple days later, he came back with his “NYC CREW,” which included Kim Kardashian. 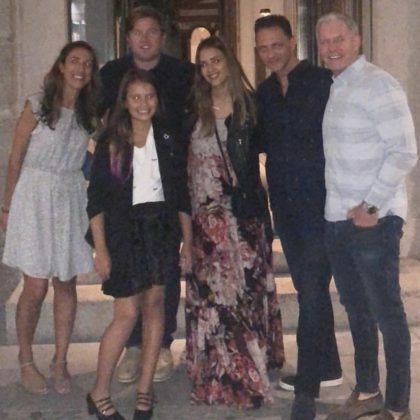 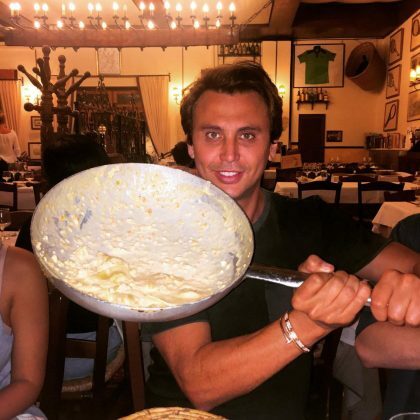 Jonathan Cheban enjoyed another Il Pastaio meal in June 2017. 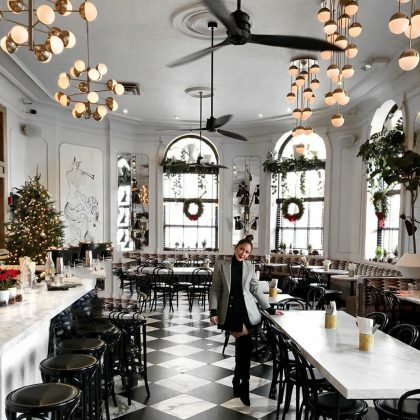 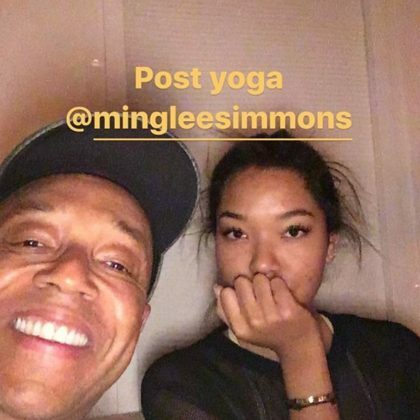 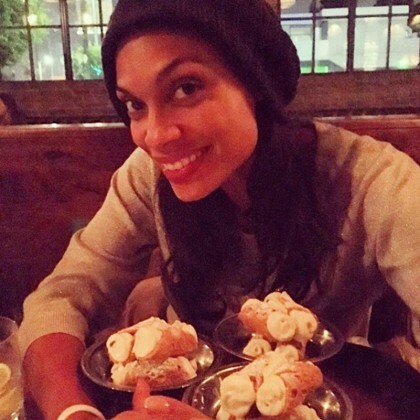 “I believe in rolling sans makeup, throwing shades on, wearing cozy, pajama inspired pieces with loafers on rainy days & eating at darling places like” Pietro NoLita is what Adrienne Bailon﻿ said when she was here in June 2017 and ordered an egg sandwich ($12), the violetta cocktail ($13), and homemade tiramisu ($12) for dessert. 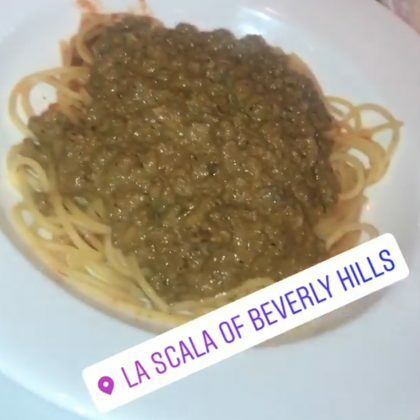 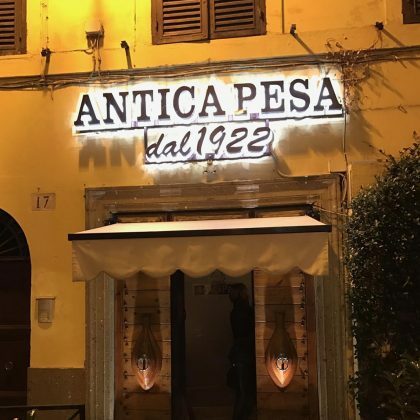 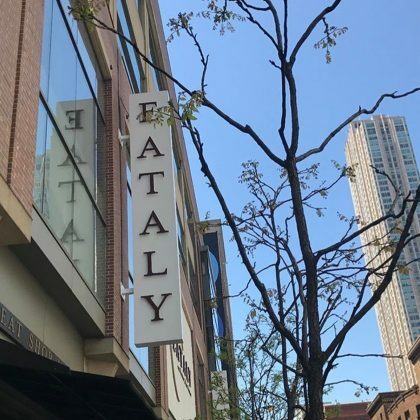 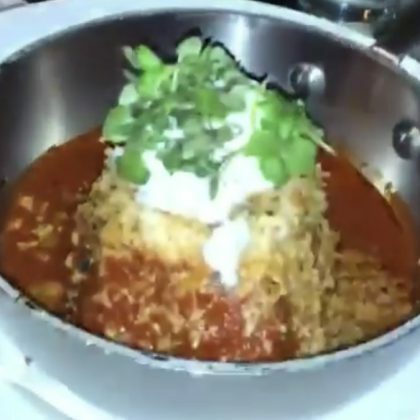 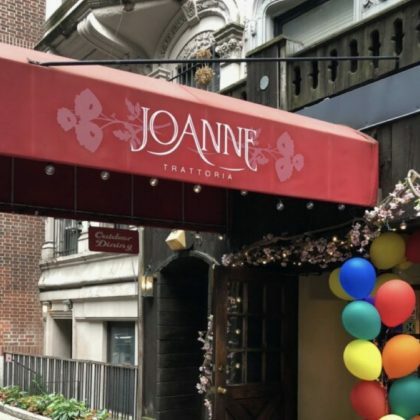 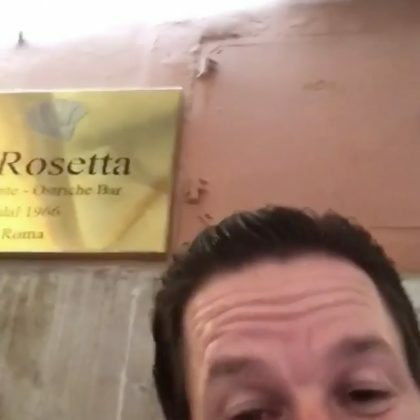 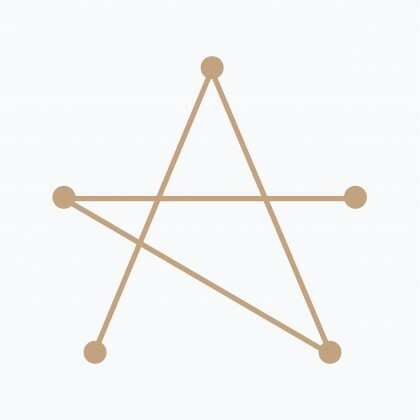 Jonathan Cheban﻿ ordered the spaghetti alla bolognese ($19.25) from this Italian restaurant in June 2017. 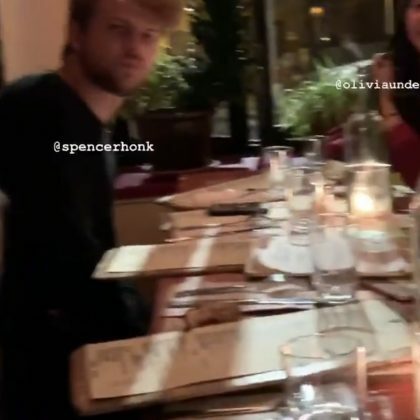 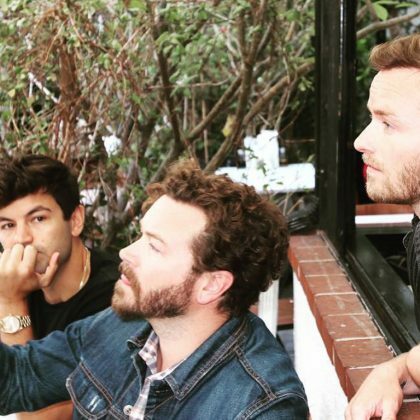 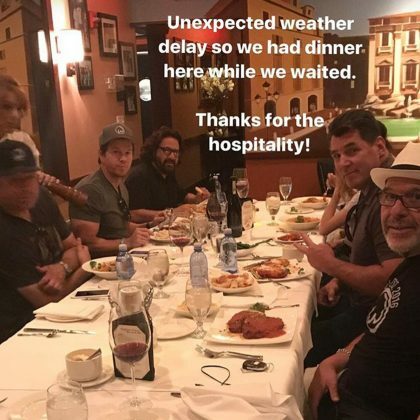 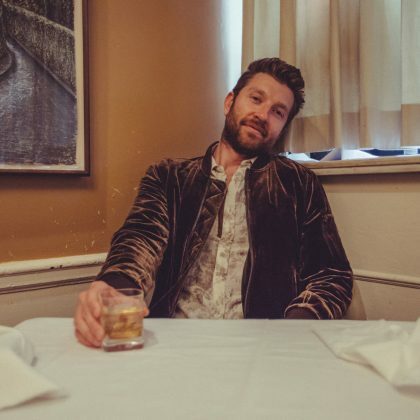 “3 outa 5 for dinner ain’t bad” is what Danny Masterson said about having dinner with some of his siblings at Speranza in June 2017. 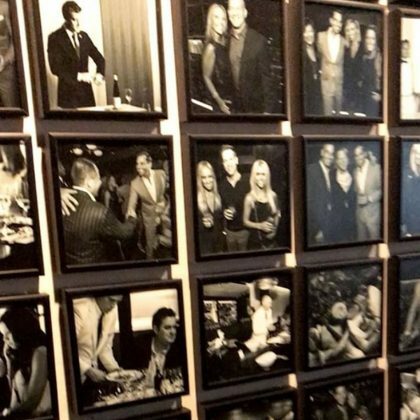 In June 2017, Giuliana Rancic showed off “The wall at @rpmitalian DC” and shared shots of the “Beyond” pasta and meatballs. 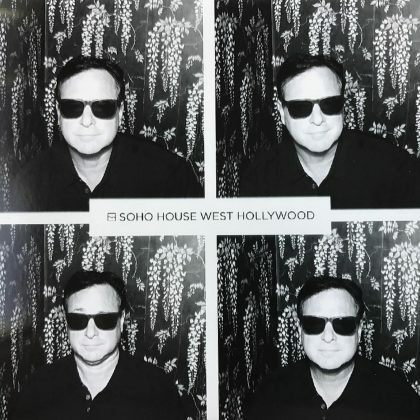 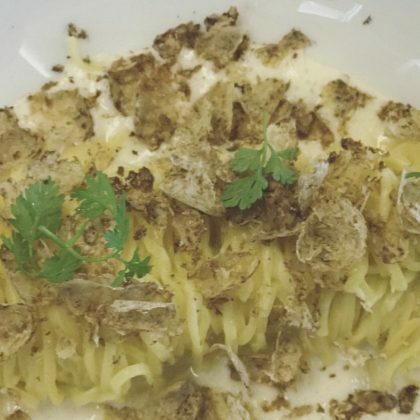 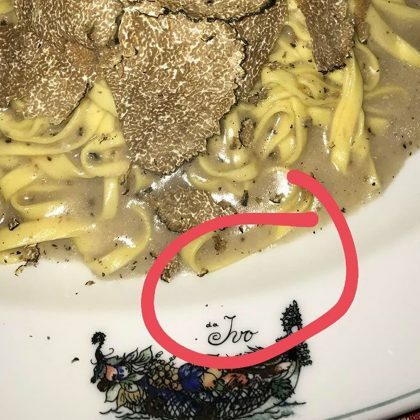 “Still full” is what Jonathan Cheban said about his truffle pasta dish from here in May 2017. 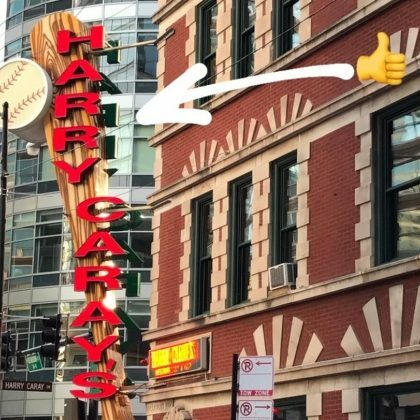 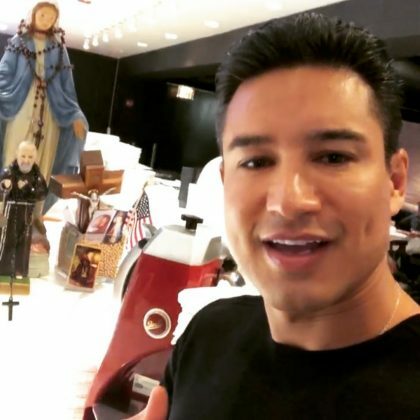 Harry Shum, Jr.﻿ pointed out the “Harry” in Harry Caray’s Italian Steakhouse, River North when he was here in May 2017. 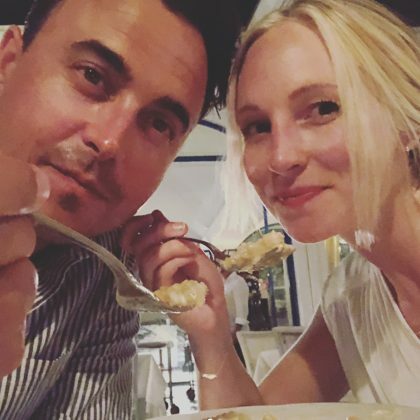 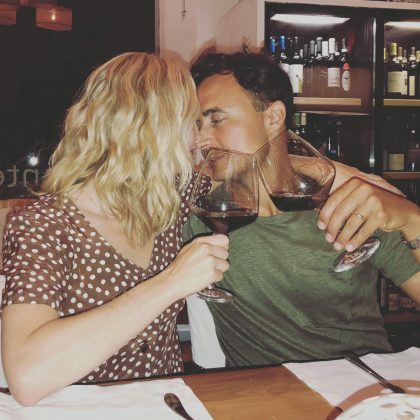 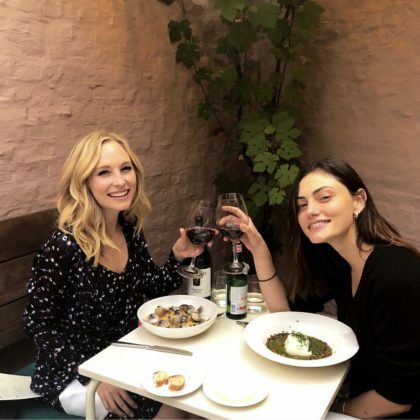 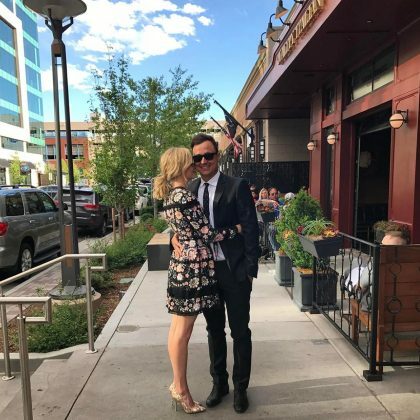 Candice Accola﻿ enjoyed some red wine while celebrating her 30th birthday in May 2017 at Quality Italian, Denver. 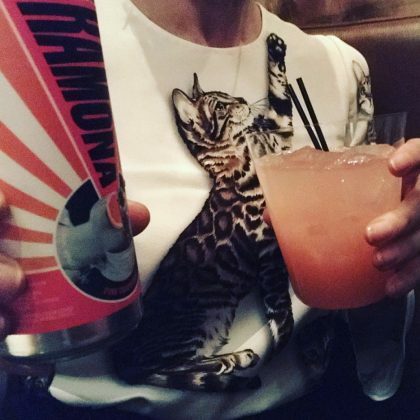 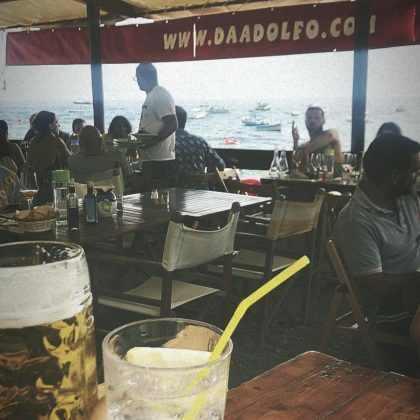 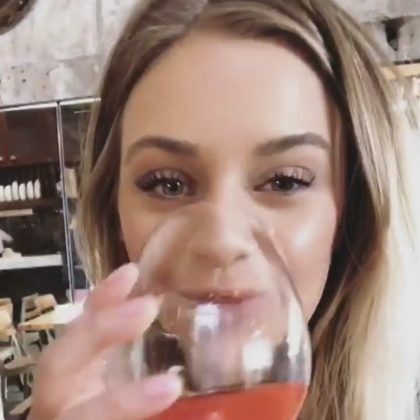 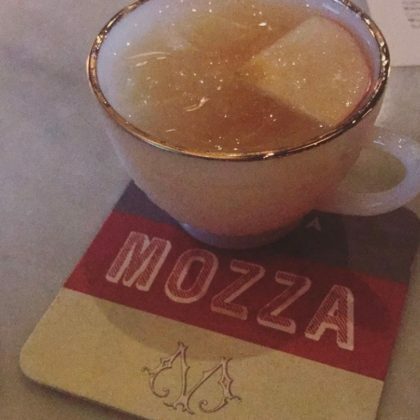 Becca Tobin﻿ tried a drink when she was at Mozza in May 2017. 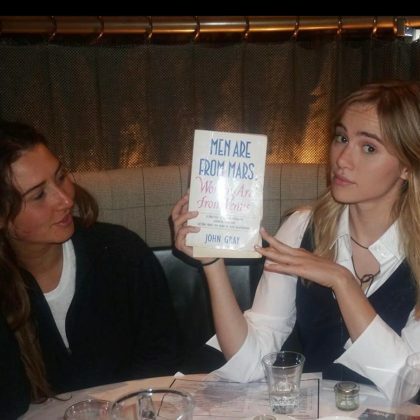 Suki Waterhouse﻿ said a friend read her excerpts from ﻿Men Are From Mars, Women Are From Venus﻿ “over cheese” at Il Pampero in May 2017. 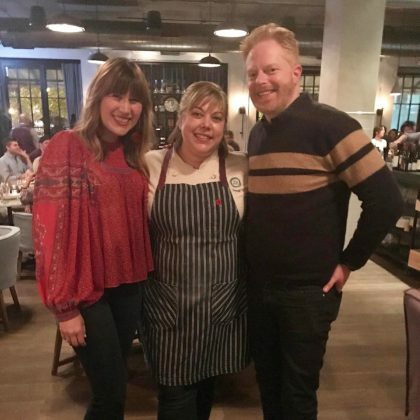 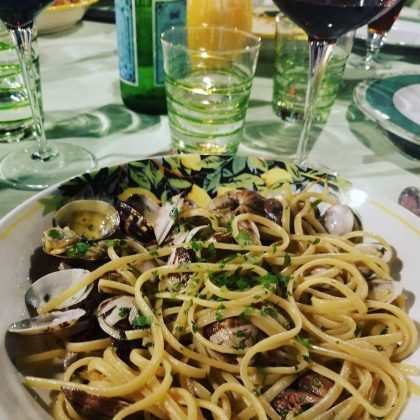 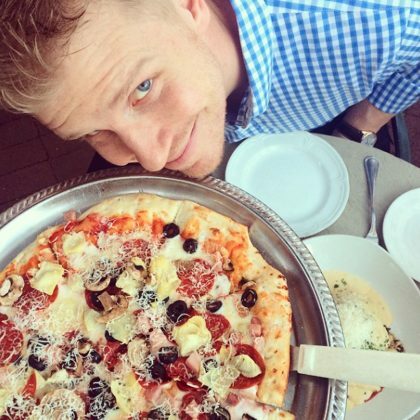 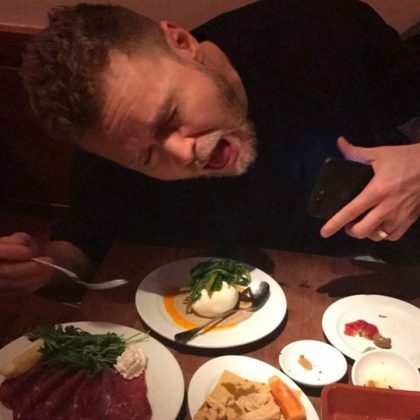 “Dinner was delicious!” is what Jesse Tyler Ferguson said when he ate at Monteverde Restaurant & Pastificio in April 2017. 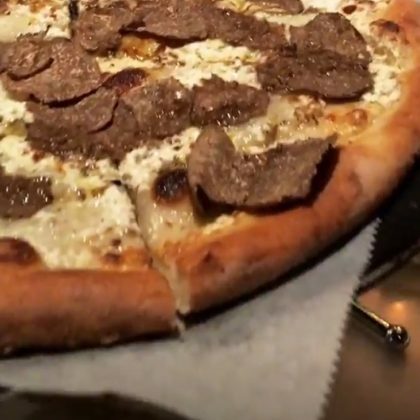 Lea Michele﻿ ate at Emporio with a friend in April 2017. 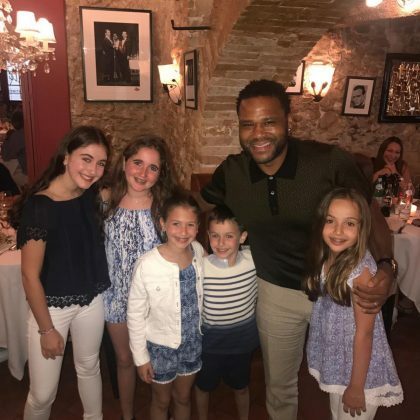 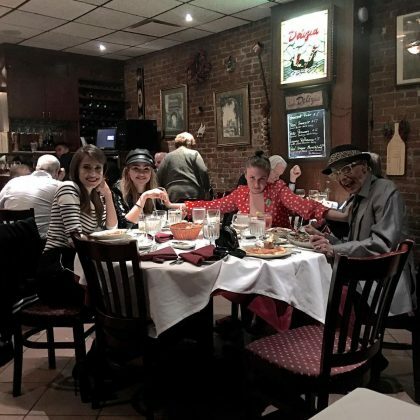 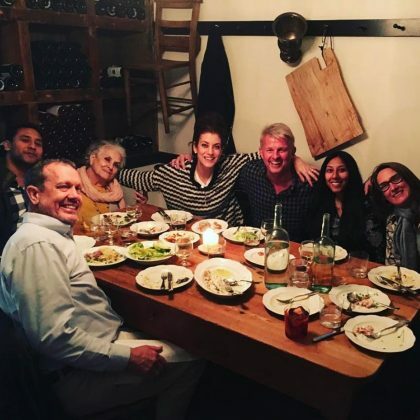 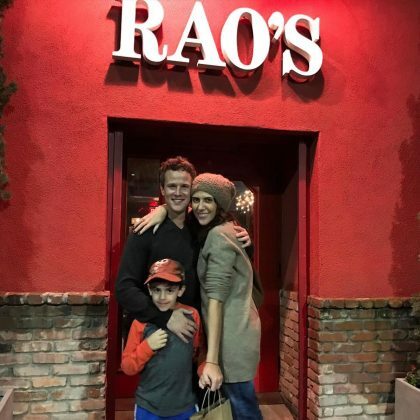 Kate Walsh did “#familydinner” with her “#nycfamiligia @viacarota” in April 2017. 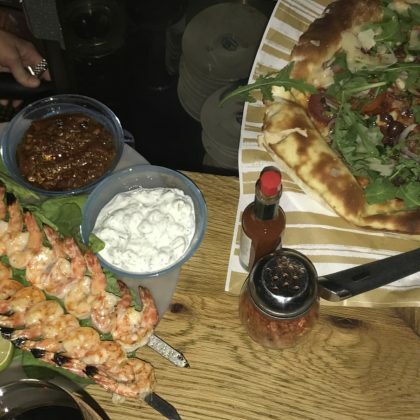 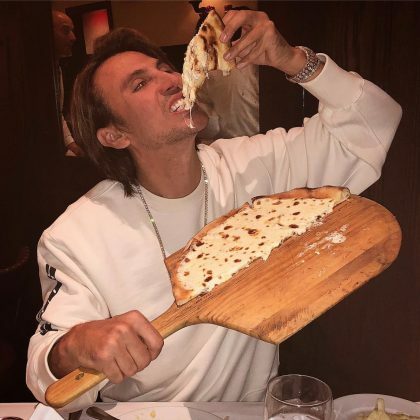 “My breadstick is bigger than yours” is what Jonathan Cheban said when his table was covered by a variety of dishes here in April 2017. 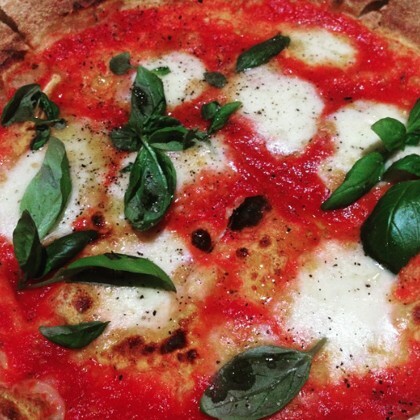 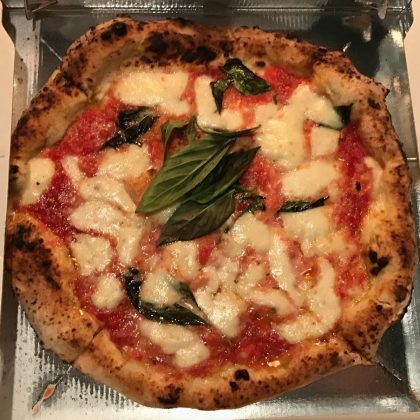 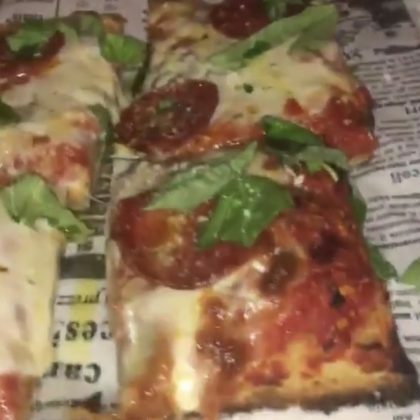 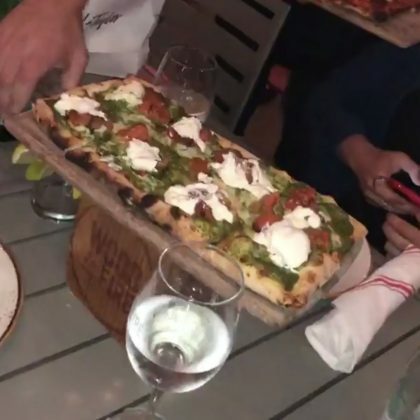 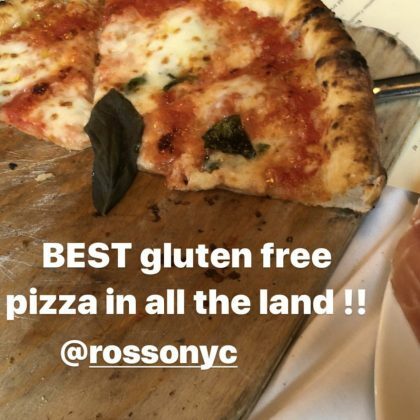 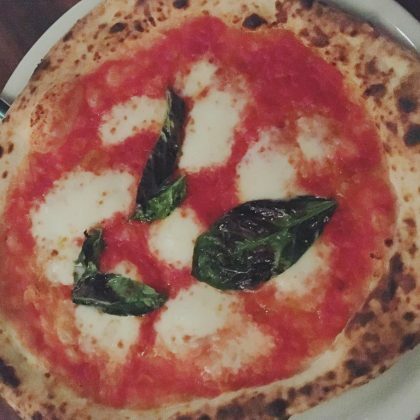 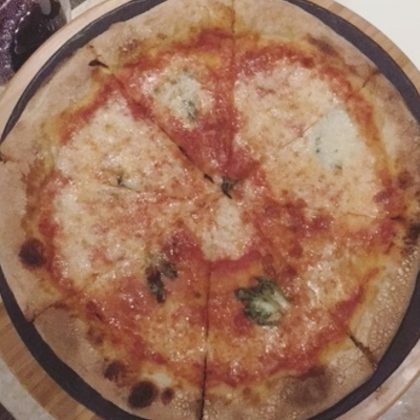 Whitney Port﻿ called her original margherita pizza ($19) at Culina “Deliciousness” in April 2017. 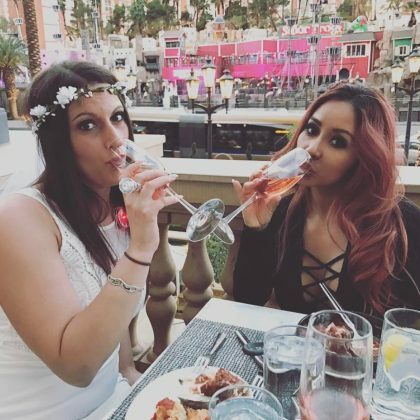 Nicole “Snooki” Polizzi﻿ and her bride-to-be friend were “Getting stuffed @lavolv” in April 2017. 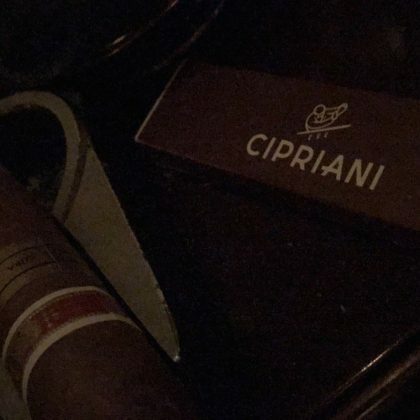 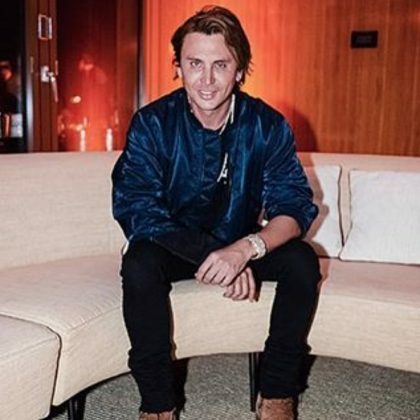 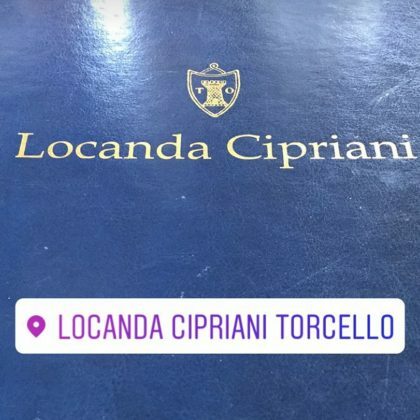 Jonathan Cheban﻿ checked in at Cipriani Downtown Miami in April 2017. 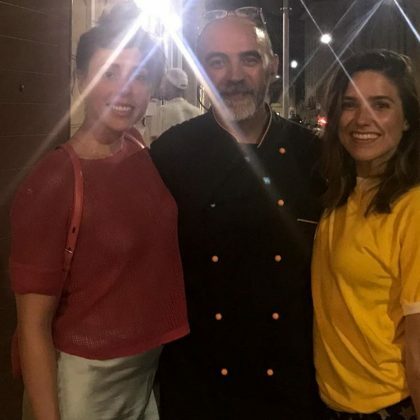 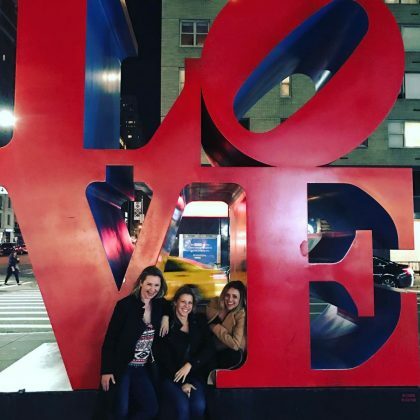 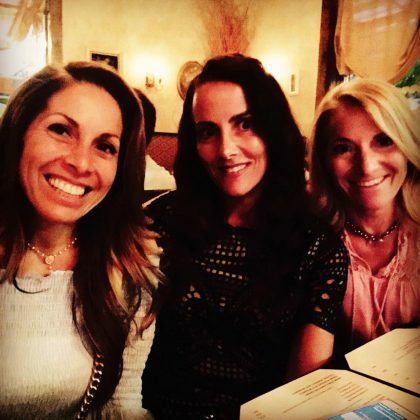 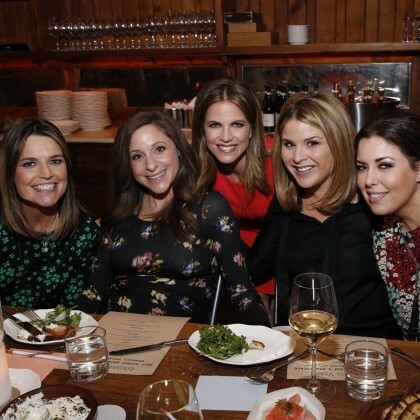 Beverley Mitchell﻿ thanked “@qualityitalian for an unbelievable meal” with her ﻿Hollywood Darlings﻿ costars, ﻿Jodie Sweetin﻿ and ﻿Christine Lakin﻿, in April 2017. 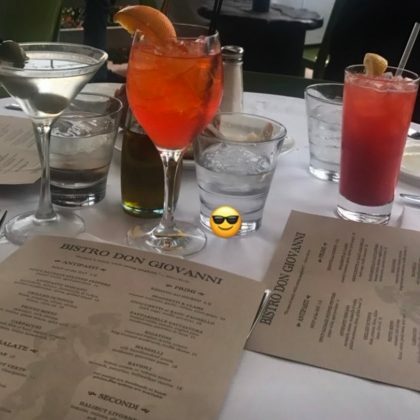 Martina McBride﻿ sat down for drinks and a meal at Bistro Don Giovanni in March 2017. 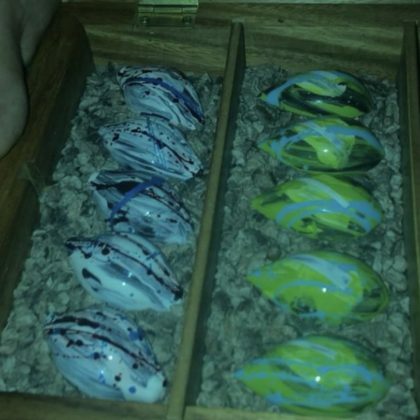 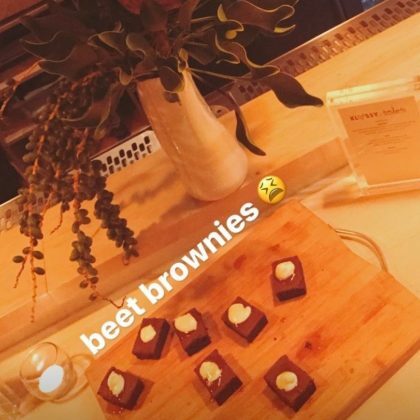 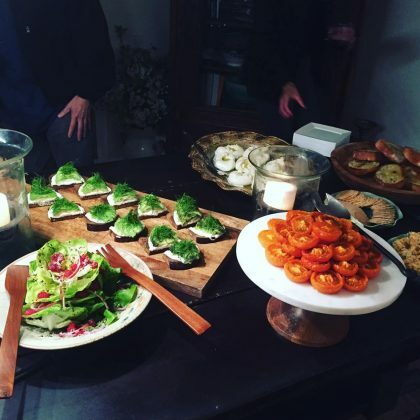 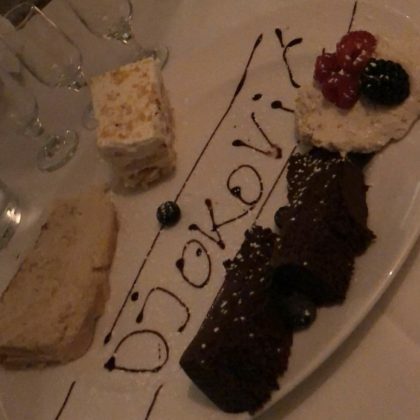 Karlie Kloss had a tray of Flora.’s “beet brownies” in front of her in March 2017. 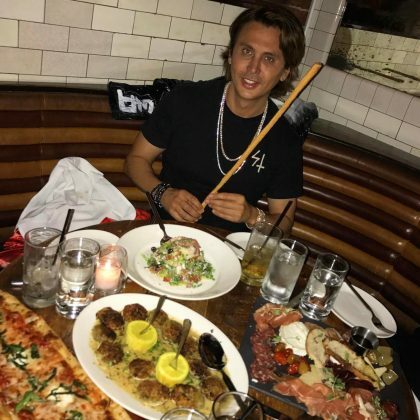 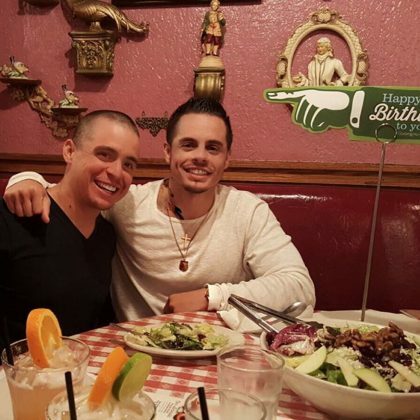 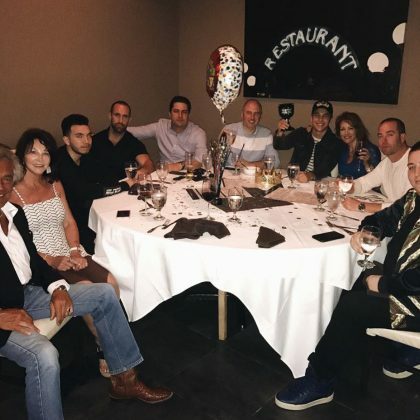 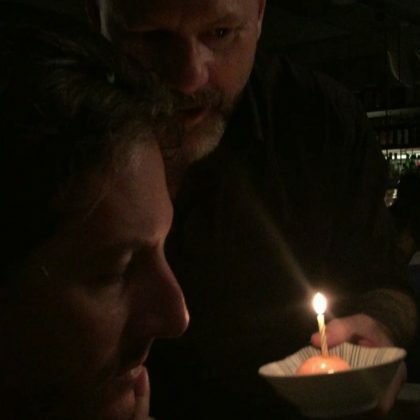 In March 2017, Jonathan Cheban celebrated a “Belated bday” here with his friend over a pasta meal and dessert platter. 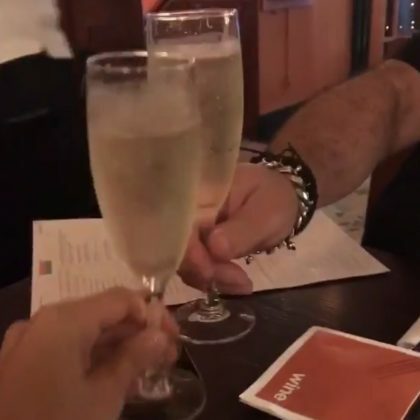 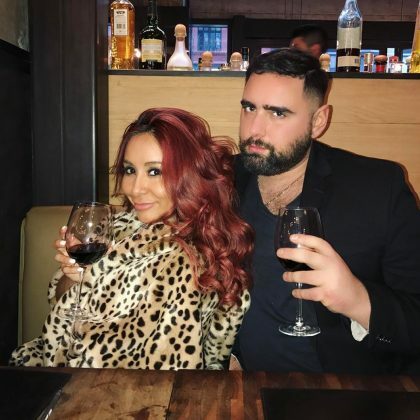 Nicole “Snooki” Polizzi “Had an amazing lunch at” Asellina — “in between meetings” in February 2017. 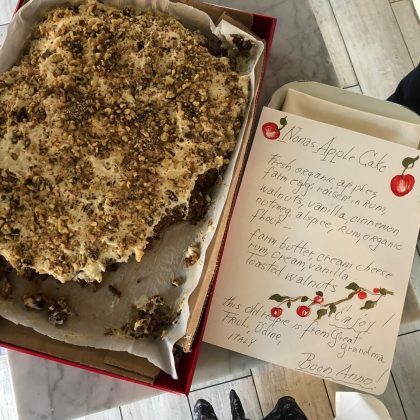 Heidi Klum﻿ dug into a slice of one of the homemade cakes from here in February 2017. 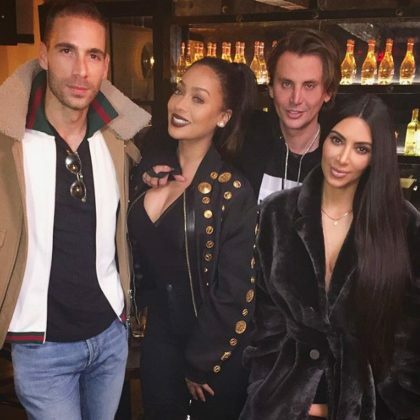 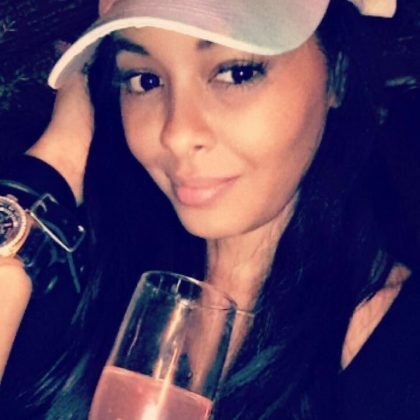 Kim Kardashian ate at Serafina Broadway with La La Anthony, Jonathan Cheban, and Simon Huck in February 2017. 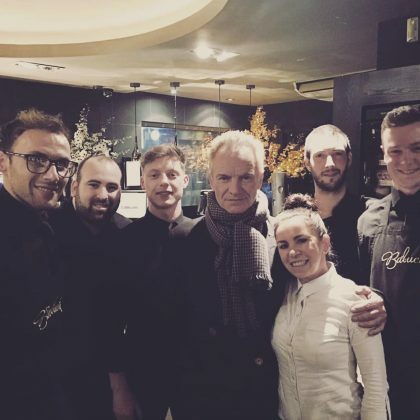 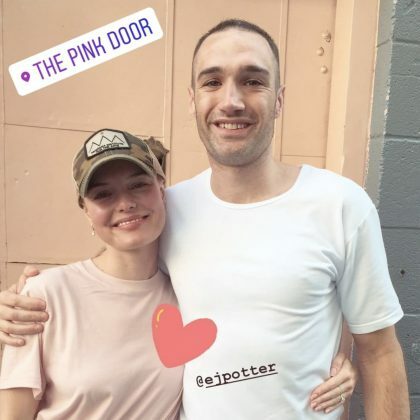 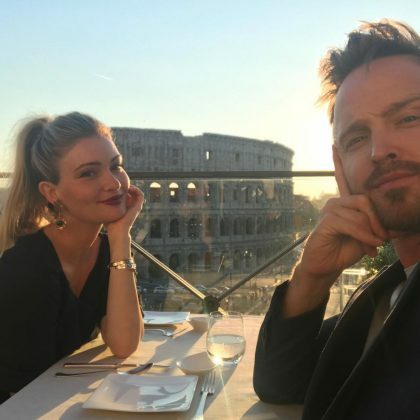 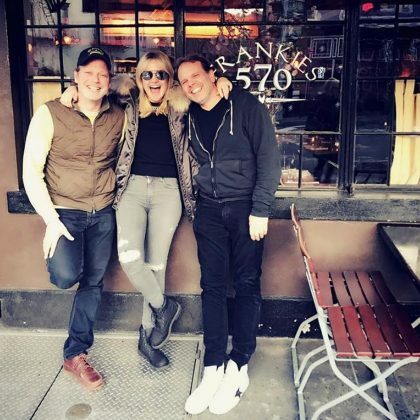 Kate Bosworth﻿ came to Union Street Café in January 2017 with a friend. 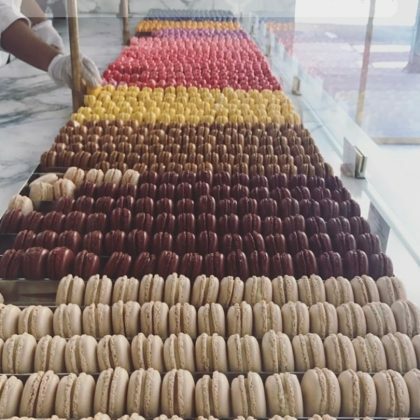 Zach Braff was back in January 2017 to admire the colorful spread of macarons. 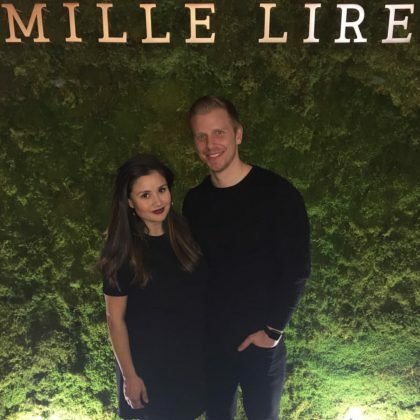 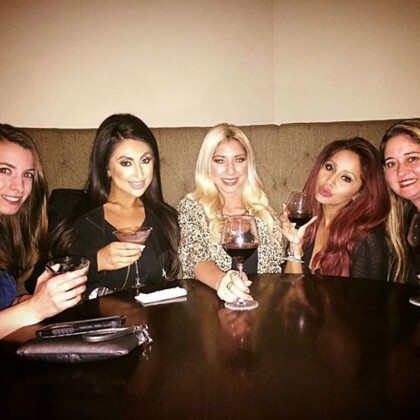 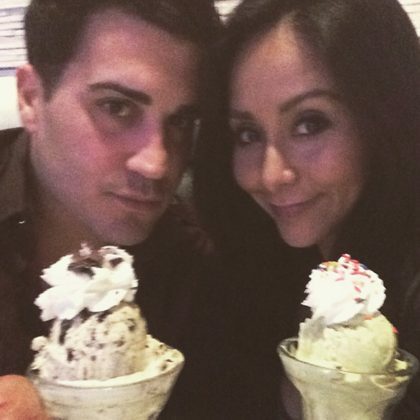 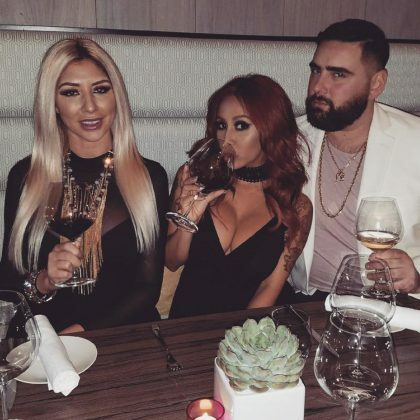 Nicole “Snooki” Polizzi﻿ celebrated a friend’s birthday with “the most fabulous dinner ever” at Impero Caffè in January 2017. 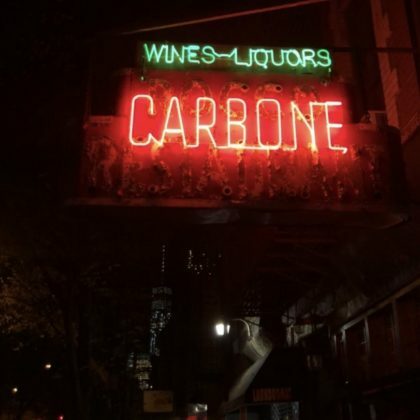 “This town” is what Amy Schumer said with a smile when she was back at this spot for a beer in December 2016. 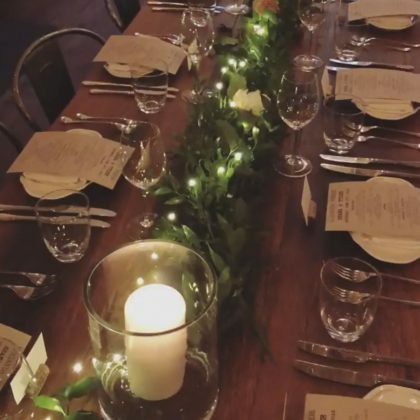 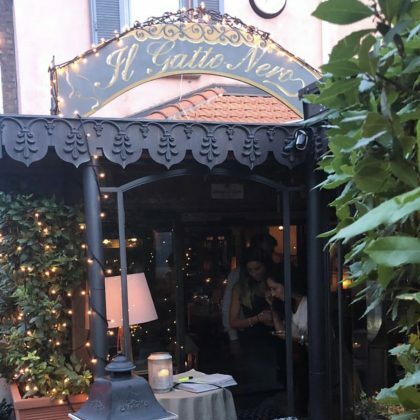 Stephanie Pratt ﻿had wine and pasta with her friends here in November 2016. 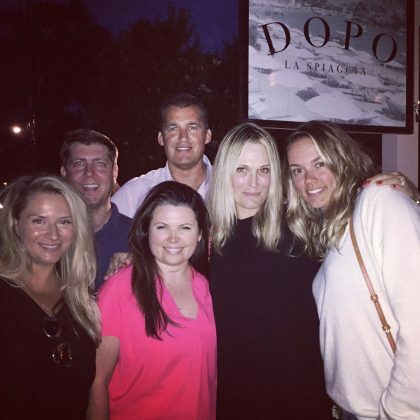 Maria Sharapova﻿ said “Cheers” to “carbs, and fluffy hats!! 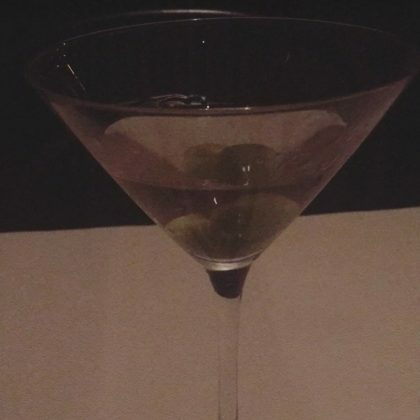 (Oh!! 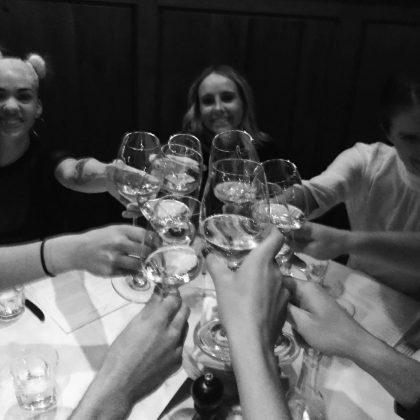 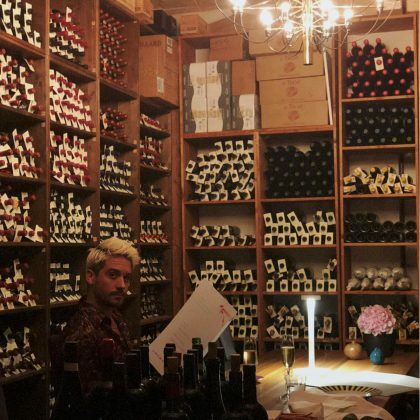 And endless, non sweat-proof workouts)” when she raised a glass at Maialino in November 2016. 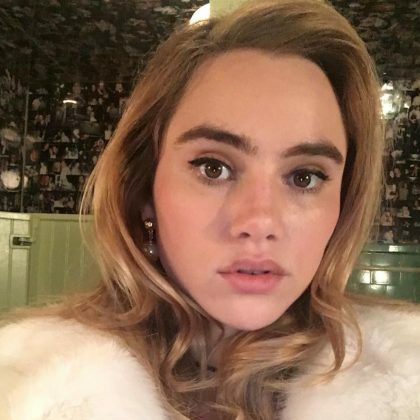 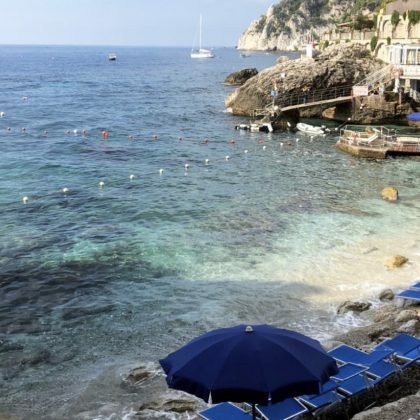 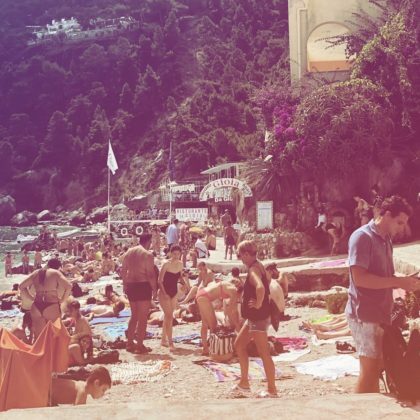 Suki Waterhouse﻿ was checked in at this Italian food hotspot in November 2016. 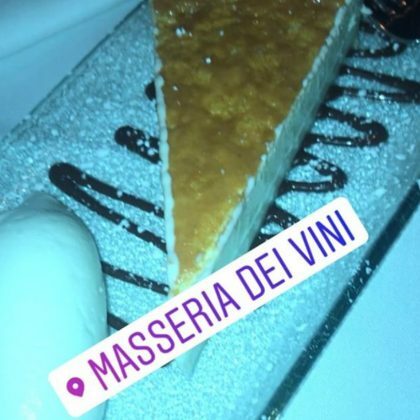 Sofia Richie﻿ met a friend for a meal at Mauro’s Restaurant in November 2016. 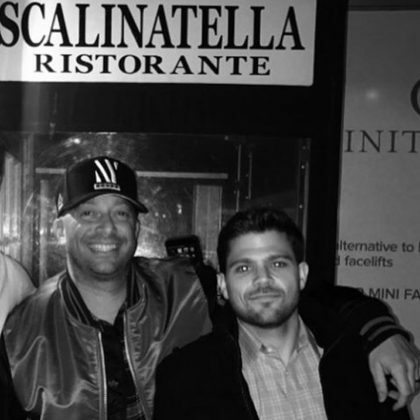 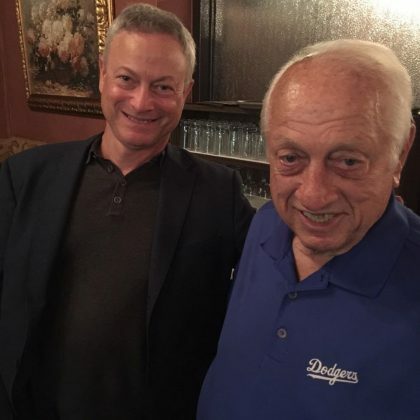 Emily Ratajkowski﻿ had a drink at Stella 34 Trattoria in November 2016. 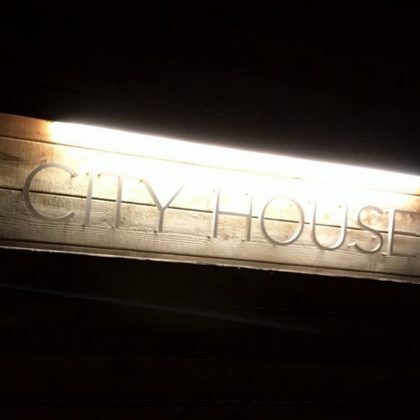 Martina McBride﻿ was at City House in October 2016. 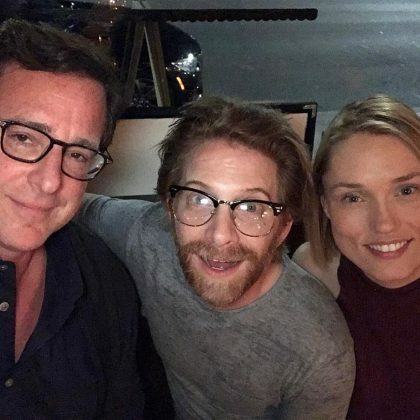 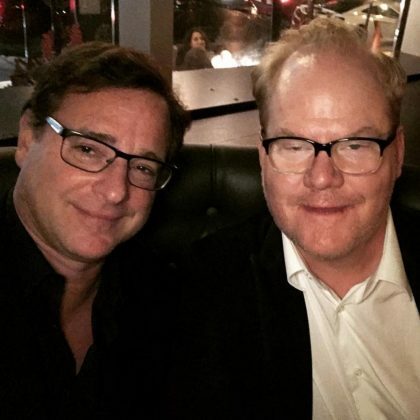 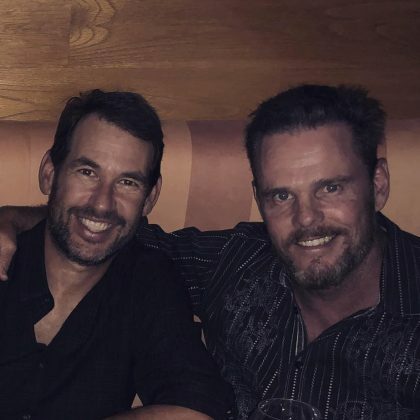 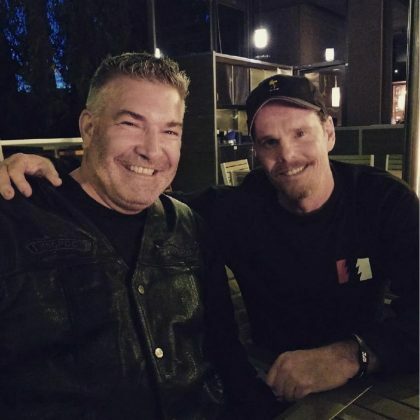 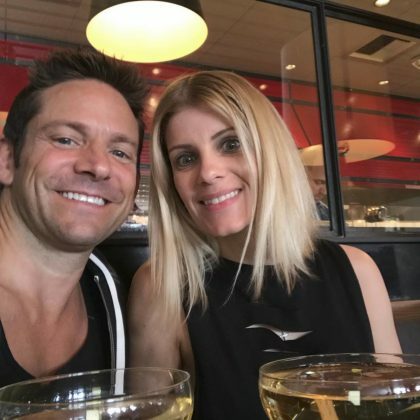 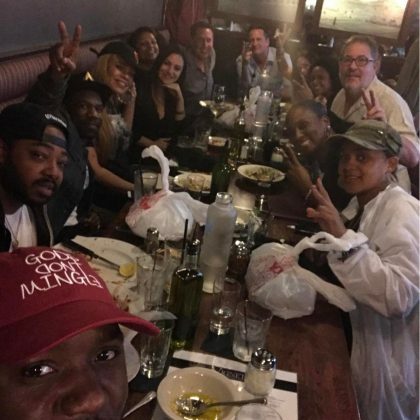 Bob Saget﻿ said it was “Fun times as always with my friends” — ﻿Seth Green﻿ and his wife — at Gusto in September 2016. 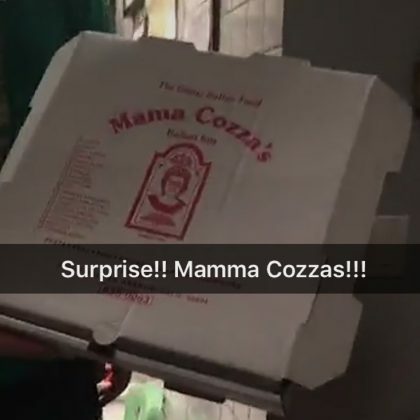 Shay Mitchell﻿ ordered a pizza from Casa Nonna in September 2016. 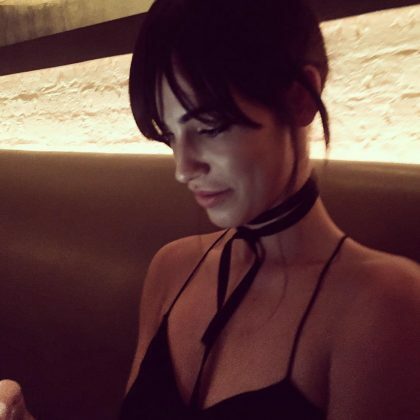 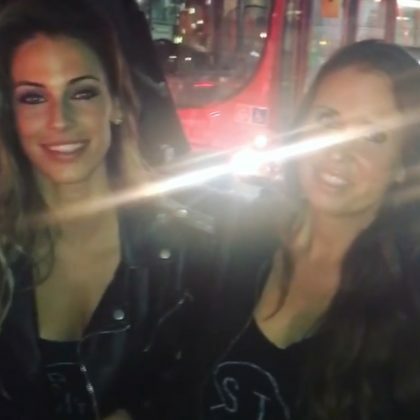 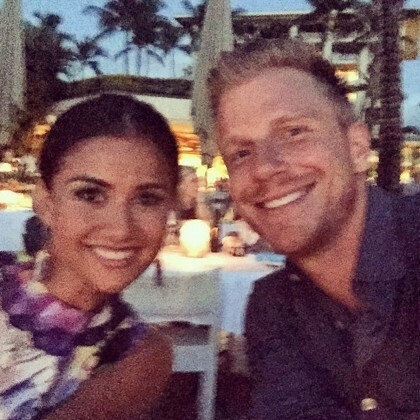 Jessica Lowndes﻿ was “Caught flirtexting” while checked in to Giorgione in September 2016. 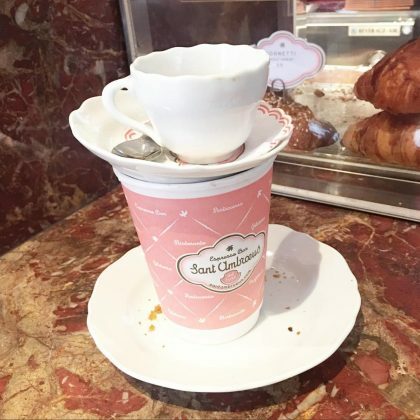 Emily Ratajkowski﻿ sat outside at Sant Ambroeus SoHo in September 2016 to order a cup of coffee. 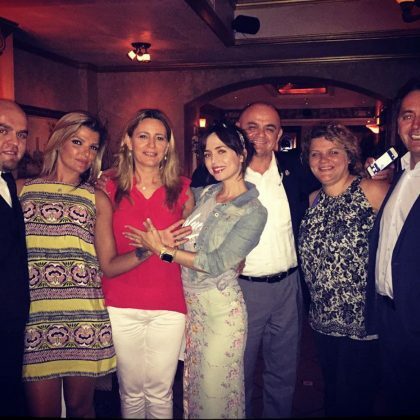 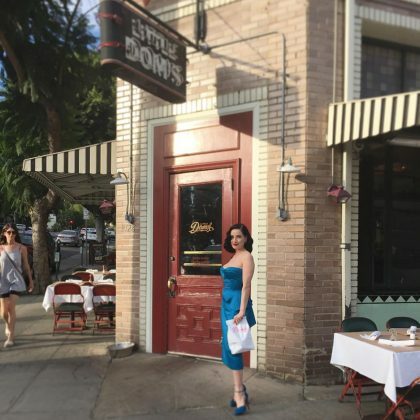 Eliza Dushku﻿ enjoyed a meal at Arté in August 2016. 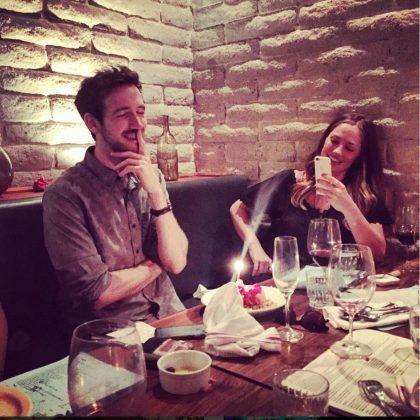 Minka Kelly celebrated a friend’s birthday with a meal at All’Acqua in August 2016. 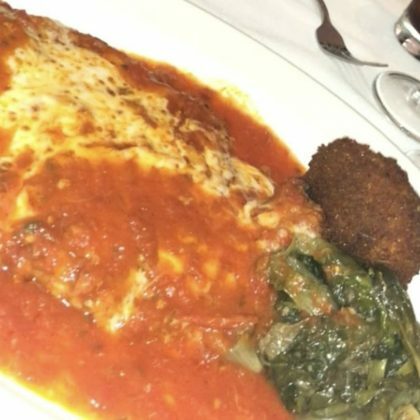 Ludacris﻿ ordered a plate of corn and seafood at Gio’s Chicken Amalfitano during a “#gamenight” in June 2016. 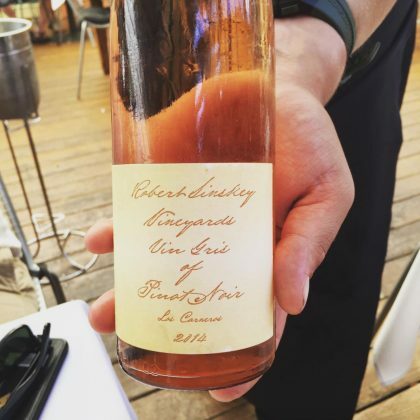 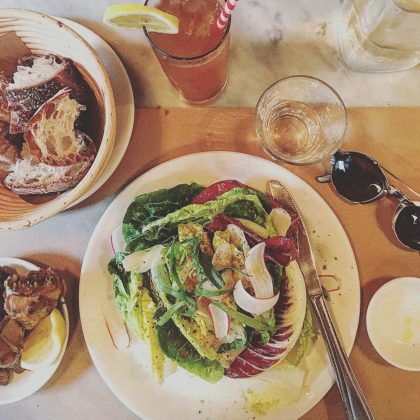 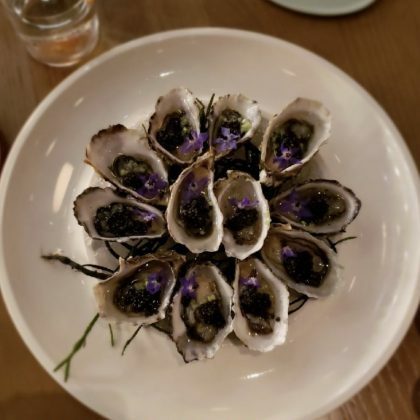 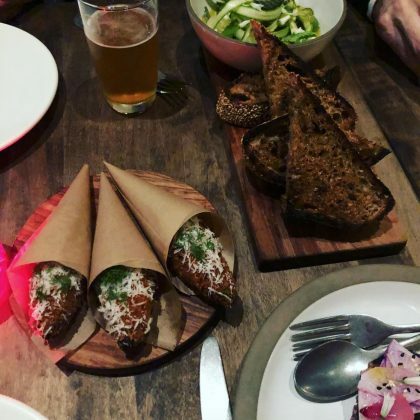 Whitney Port went to il Buco Alimentari & Vineria in May 2016 and ordered a “Simple saladm fried artichokes and an Arnold Palmer for 1” — the crispy artichokes appetizer dish is $17. 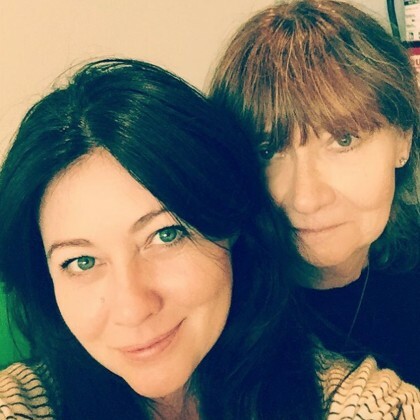 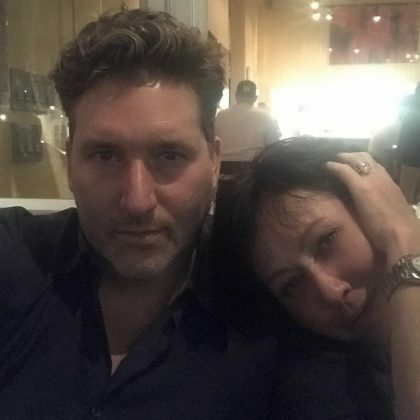 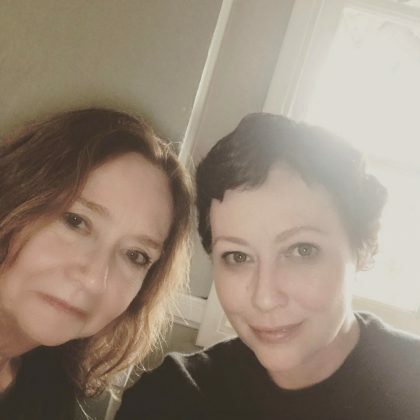 Shannen Doherty﻿ said “#girlsrule” when she and a friend went to Via Veneto in May 2016. 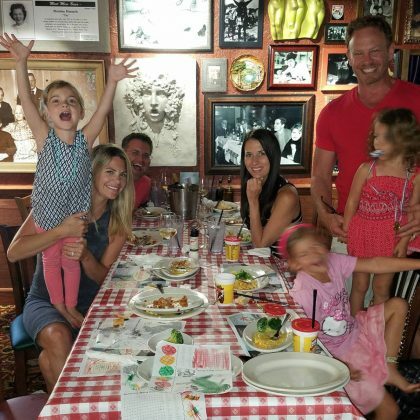 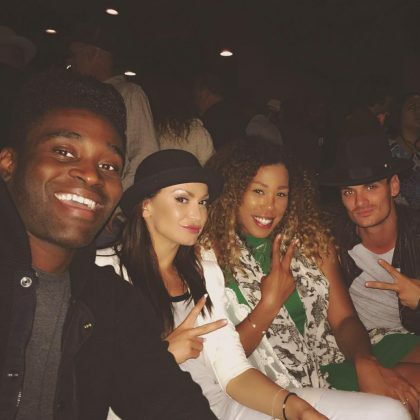 Karina Smirnoff﻿ said it was “Party time” at Butterscotch when she and some “crazy cats” were here together in May 2016. 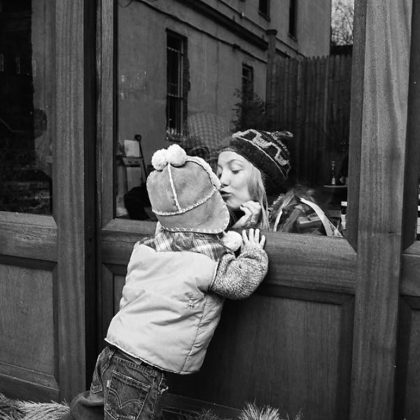 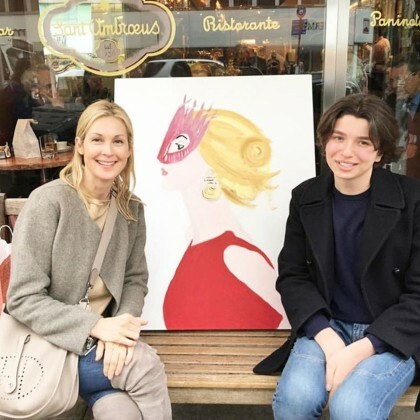 Kelly Rutherford﻿ stopped by Sant Ambroeus West Village in April 2016. 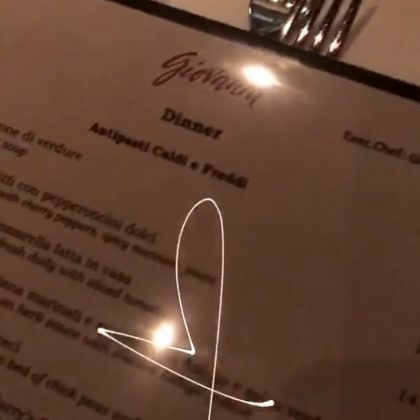 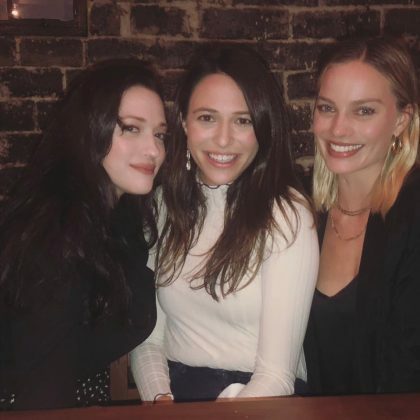 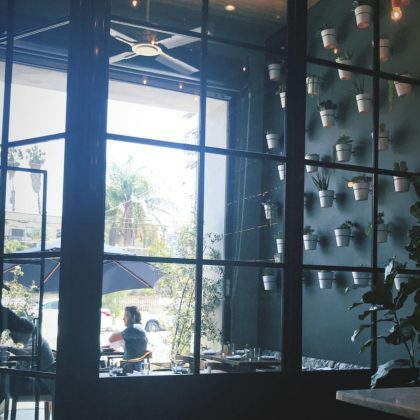 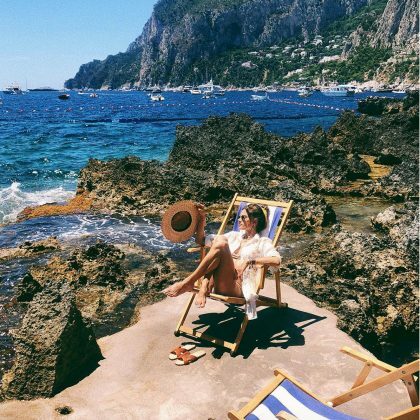 Jessica Lowndes﻿ was “Third wheelin’ it” with a friend and her man at Gemma in April 2016 and enjoyed the truffled polenta fries ($9) and tiramisu ($9). 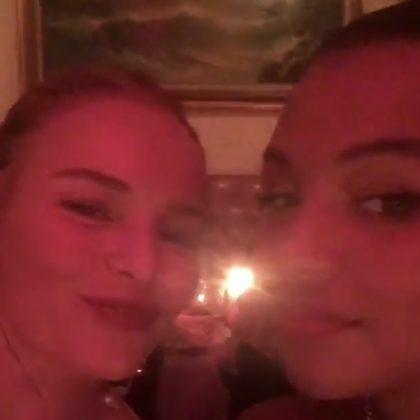 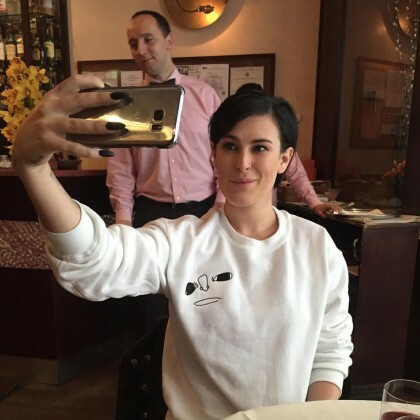 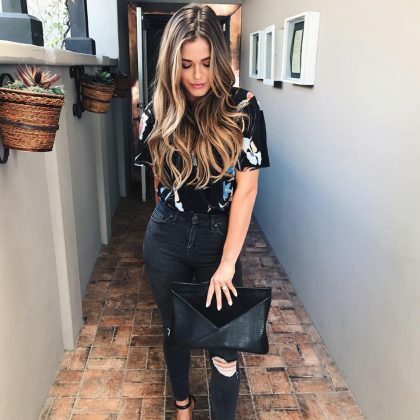 “There’s a lot going on right now” is what Tallulah Willis said of selfie-snapping sister Rumer Willis when they were at Sant Ambroeus Madison Avenue together in April 2016. 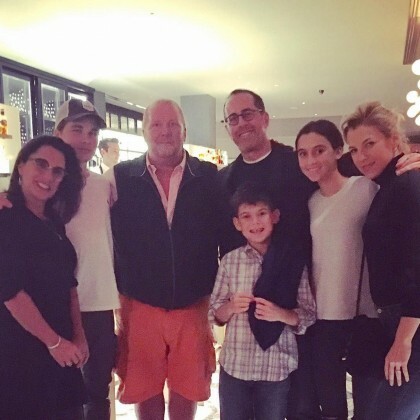 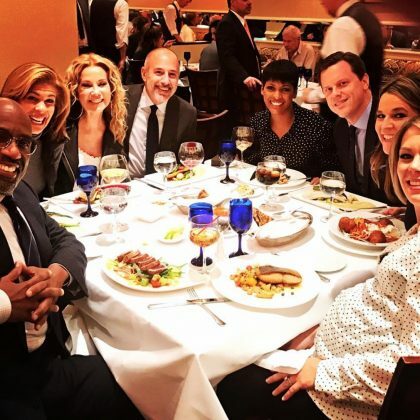 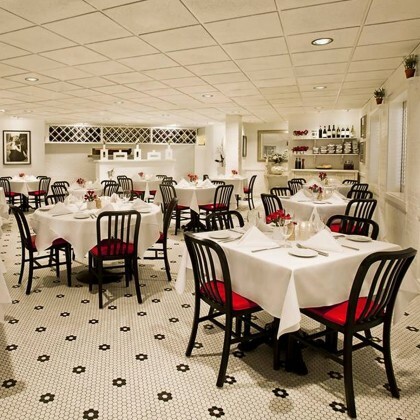 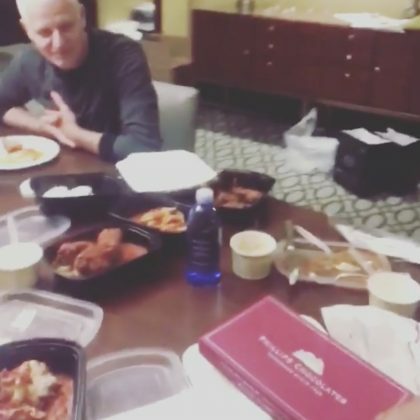 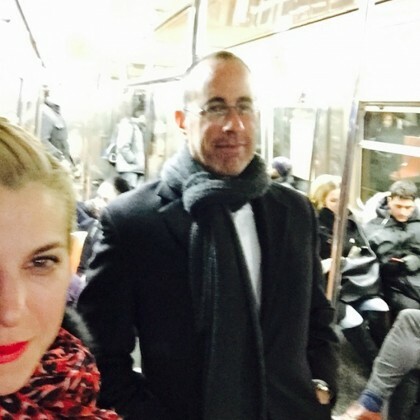 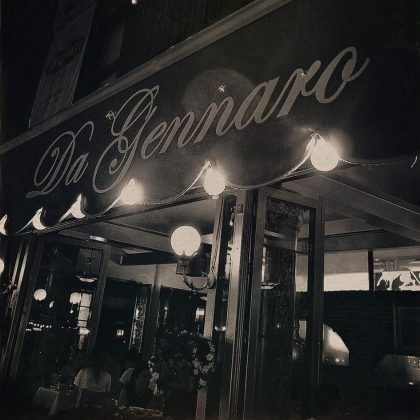 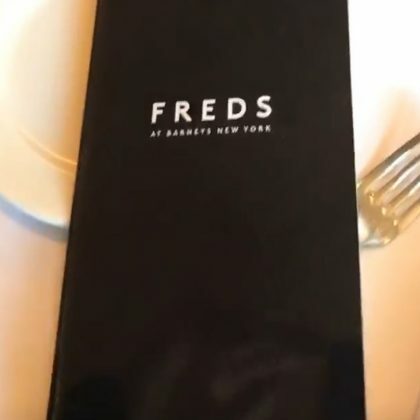 Jessica Seinfeld shared that Del Posto is “where we celebrate life’s great moments” — in April 2015, she and Jerry Seinfeld went there to mark Jerry’s 50th appearance on the Letterman show. 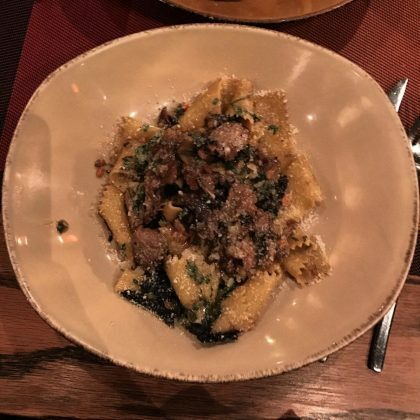 Chrissy Teigen﻿ called the cavolonero ($17) “kale salad” from Il Buco one of her favorite things in March 2016. 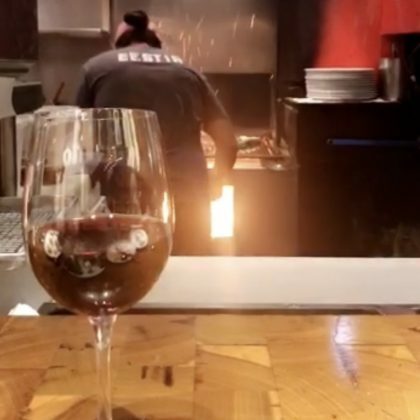 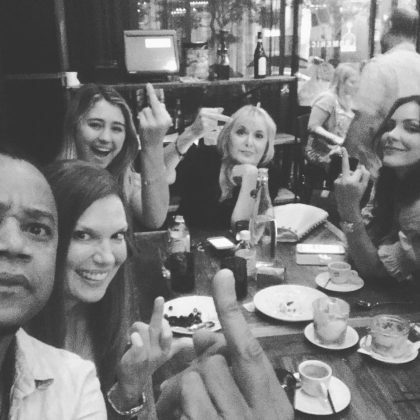 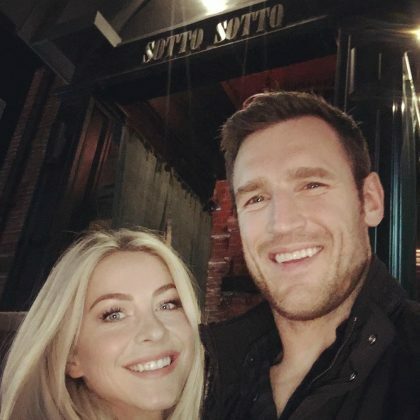 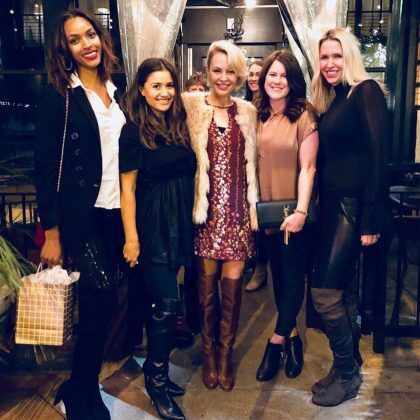 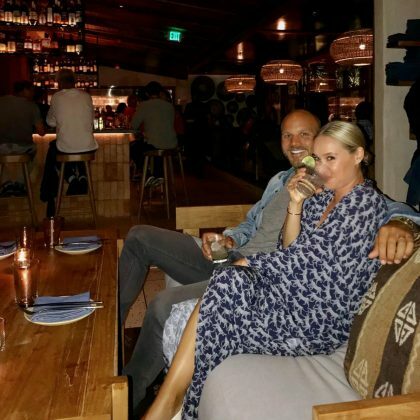 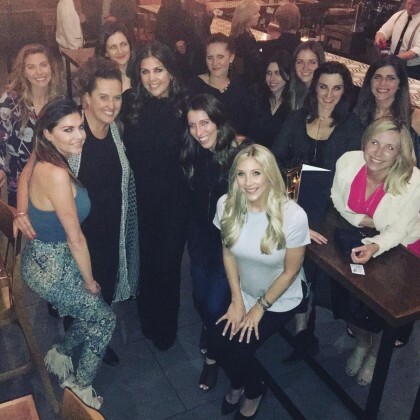 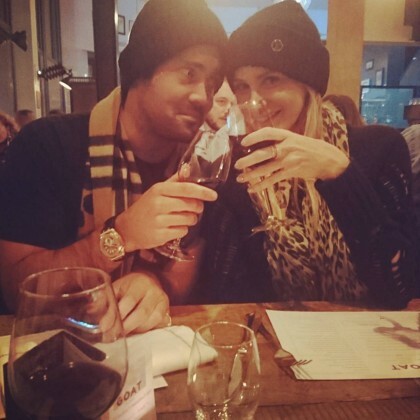 Stephanie Pratt toasted a friend with a glass of red wine at Goat in March 2016. 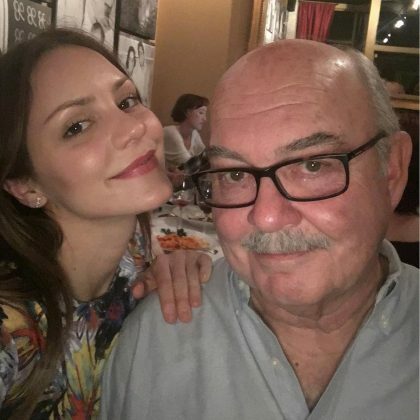 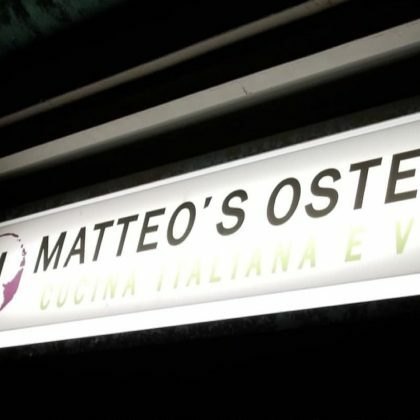 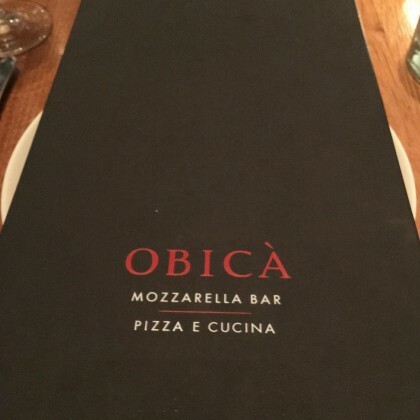 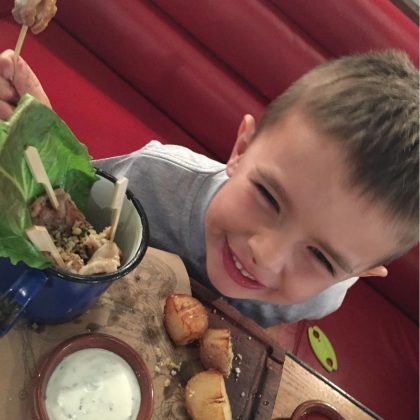 Katharine McPhee﻿ ate at Osteria Mamma with her “papa” in February 2016. 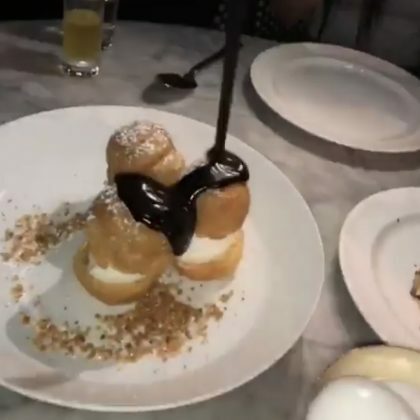 While filming an episode of Keeping Up with the Kardashians during fashion week in September 2015, Kim Kardashian and Kylie Jenner ate at Serafina Meatpacking. 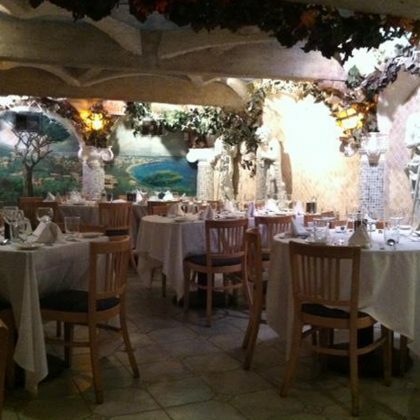 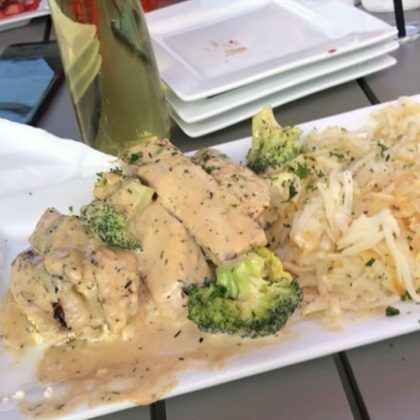 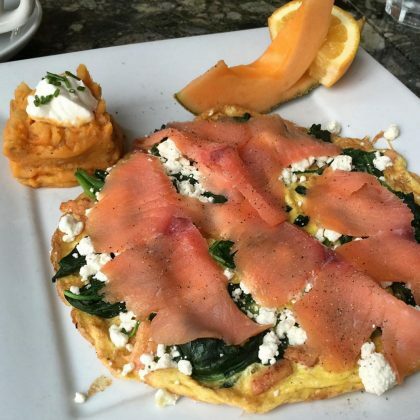 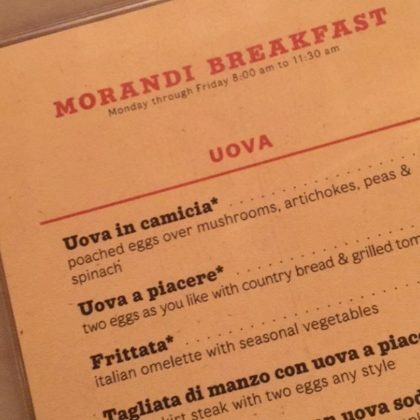 Monique Coleman﻿ went to Cafe Verona after a workout in October 2015 “Cuz sometimes you have to treat yo self” — she ordered the frittata con salmone affumicato ($16). 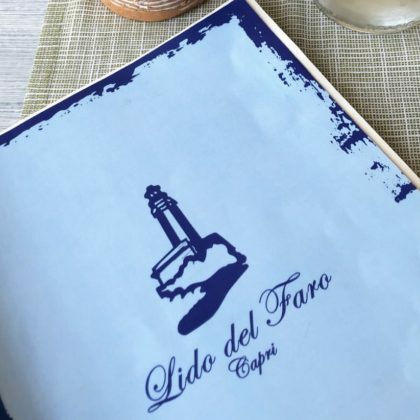 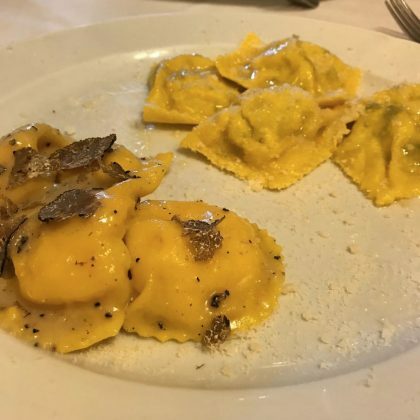 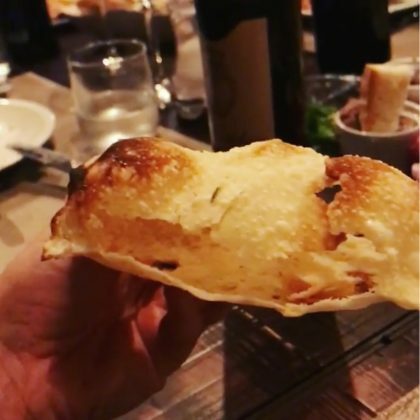 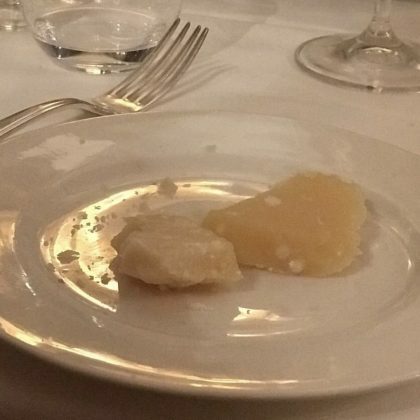 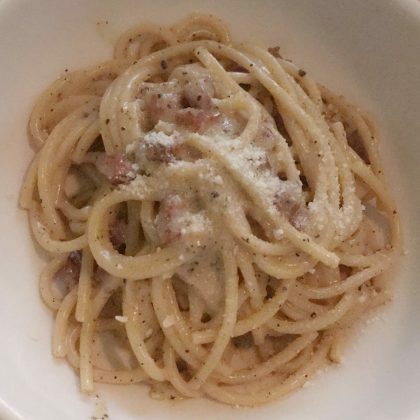 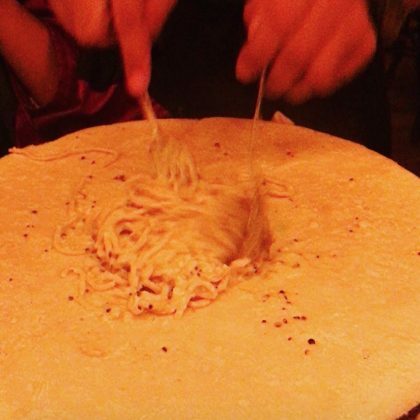 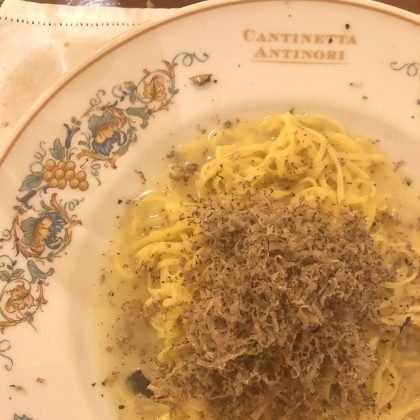 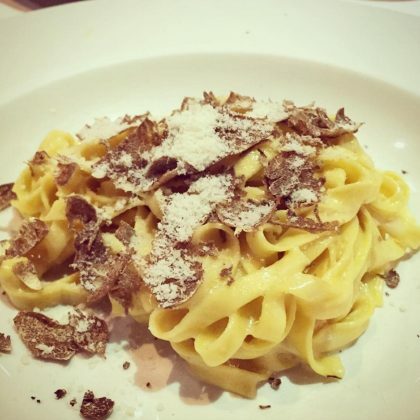 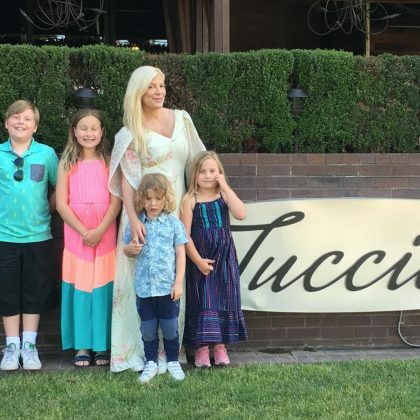 Tori Spelling was “Having one of the most amazing #WhiteTruffle pasta dishes I’ve ever had” when she was at one of the Toscanova locations in October 2015. 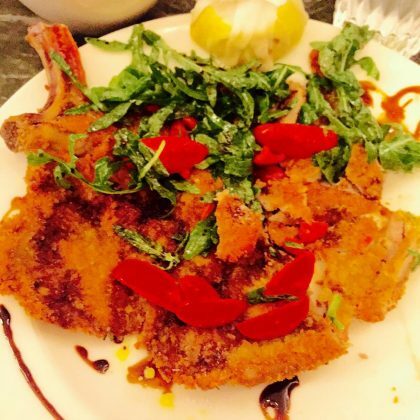 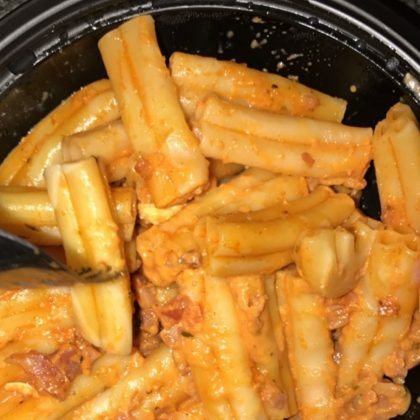 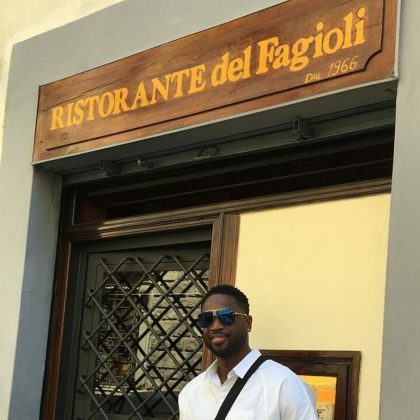 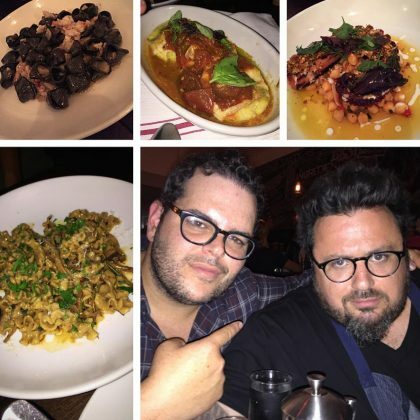 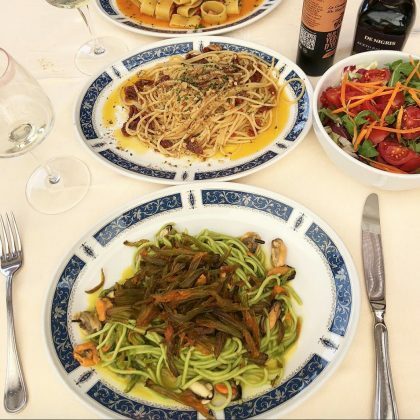 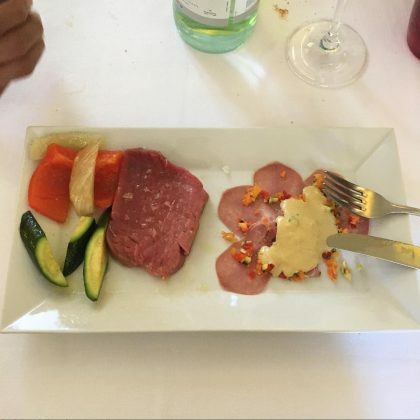 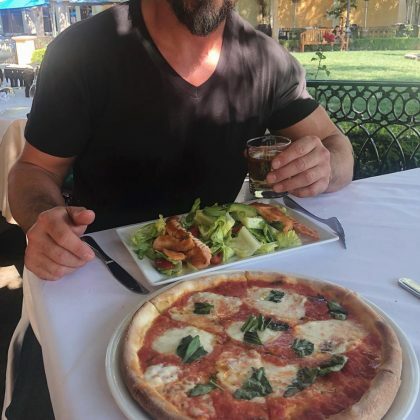 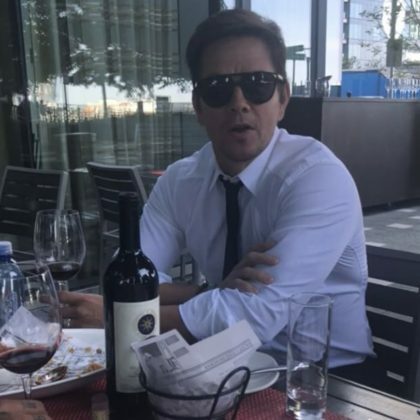 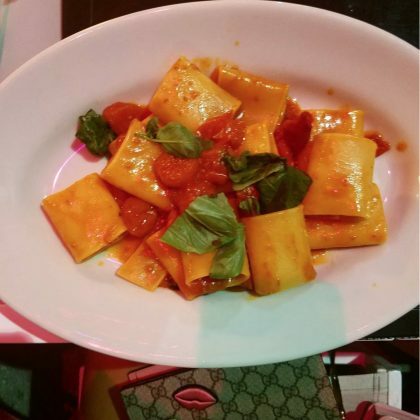 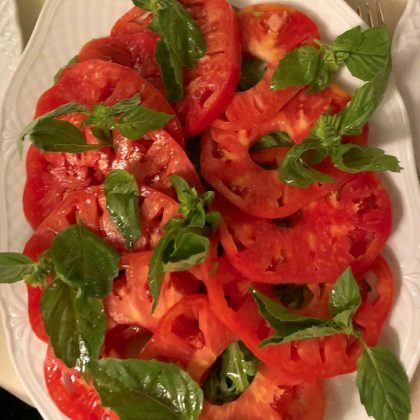 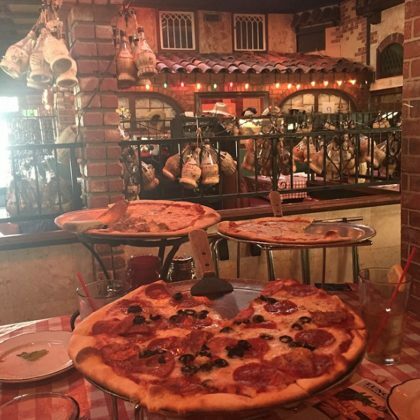 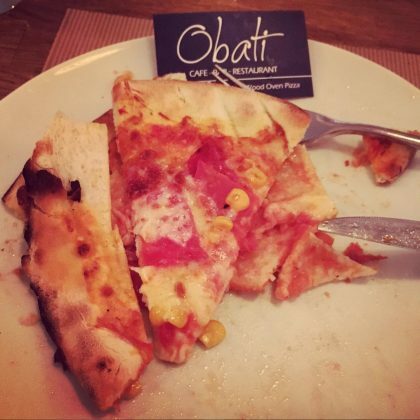 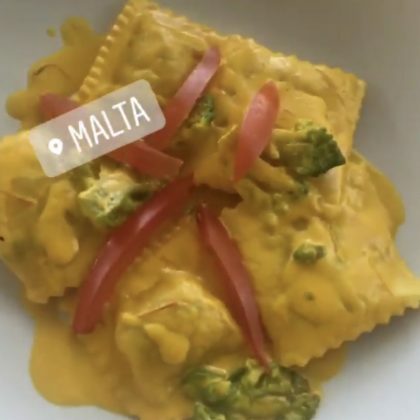 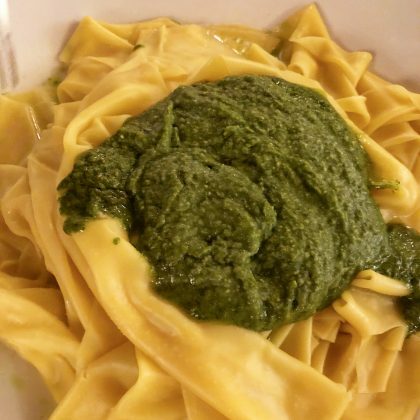 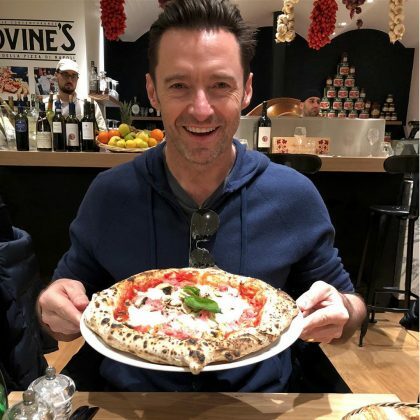 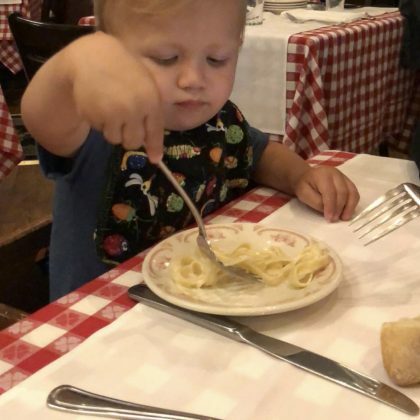 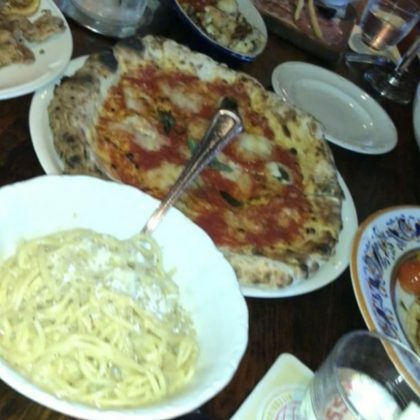 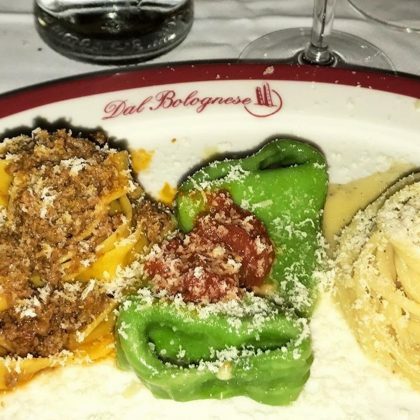 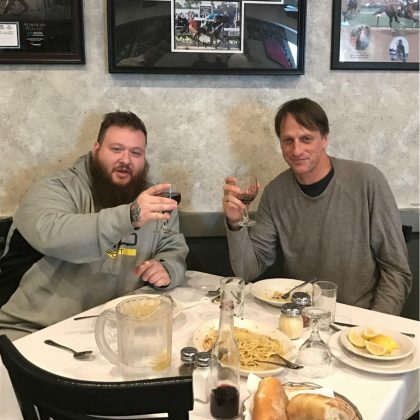 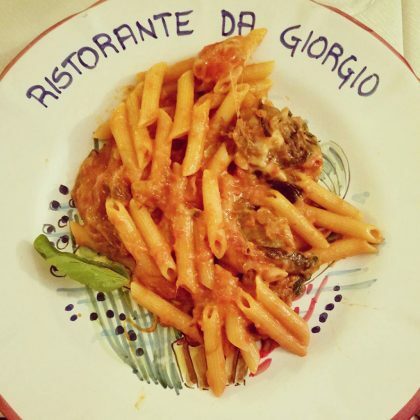 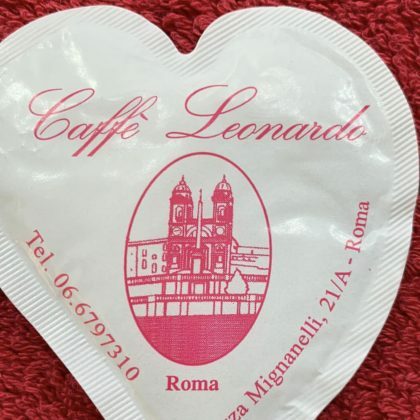 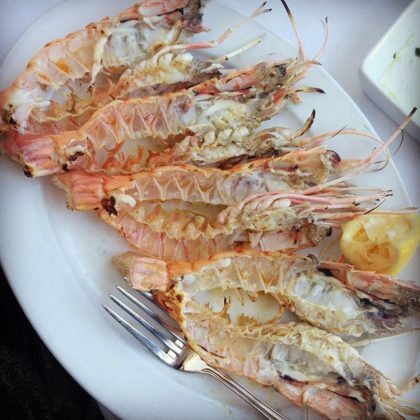 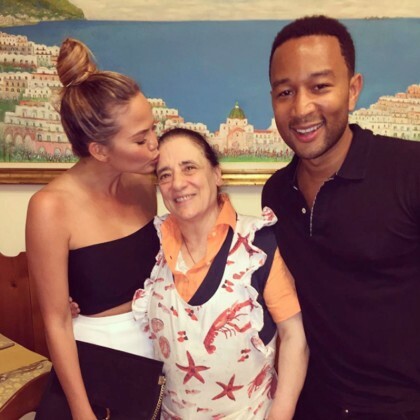 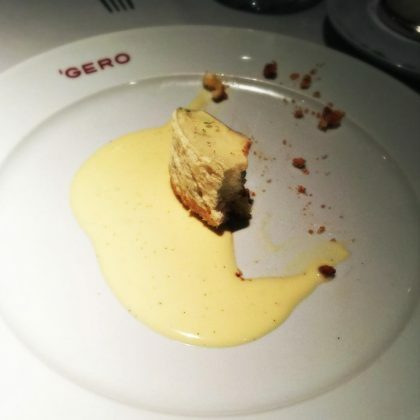 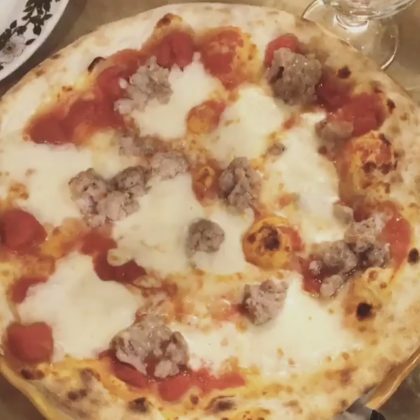 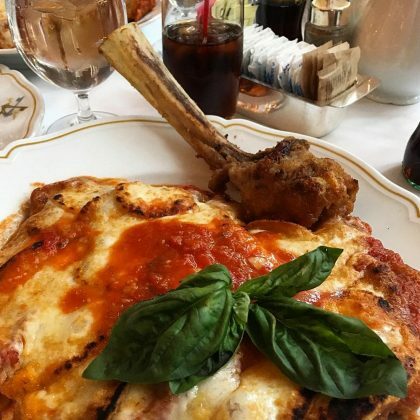 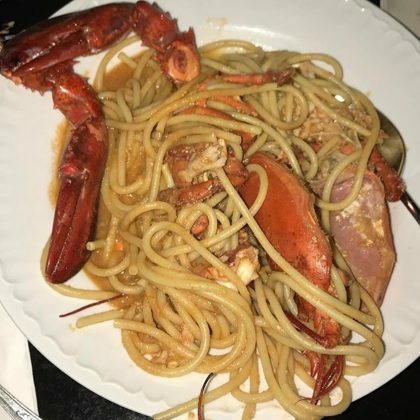 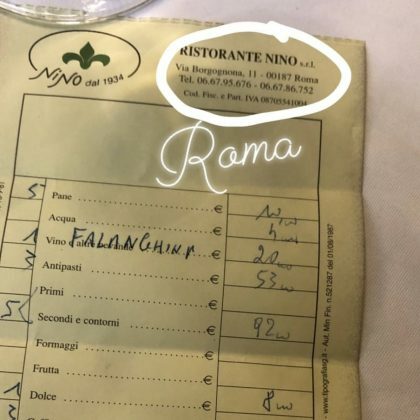 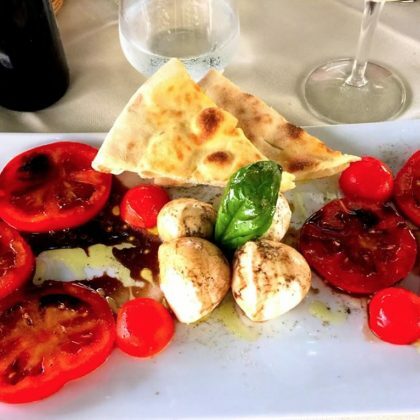 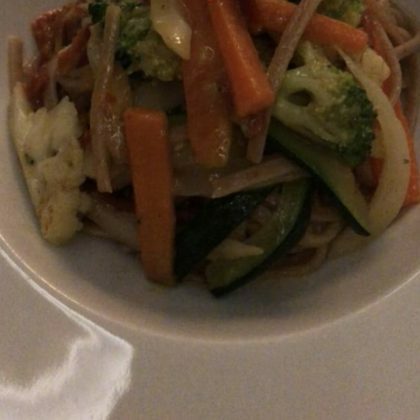 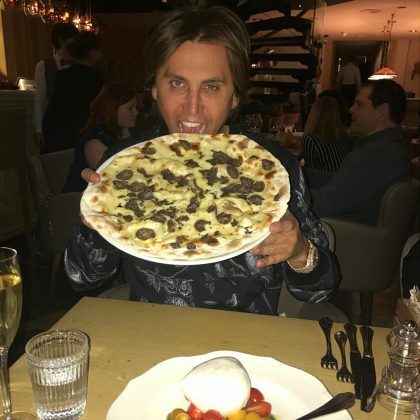 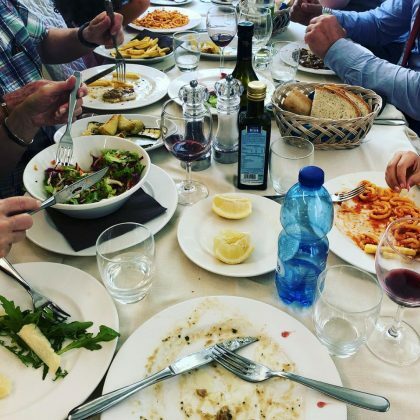 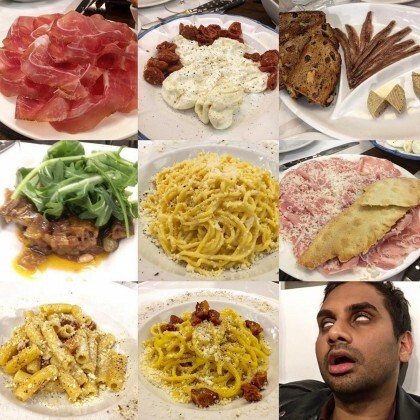 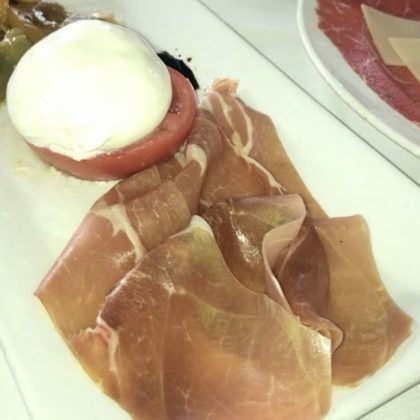 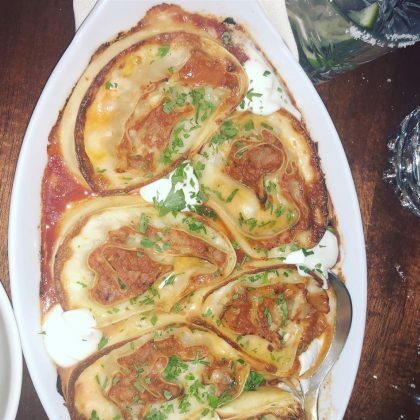 Jonathan Cheban shared a photo of “My healthy lunch today” when he ate a rich veal dish at San Pietro in October 2015. 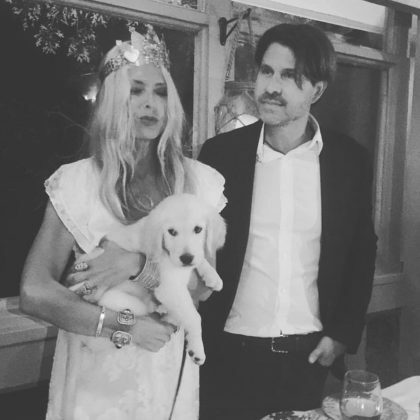 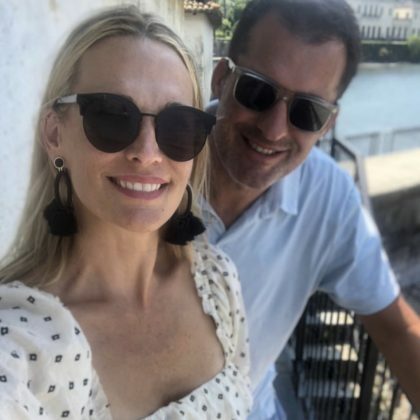 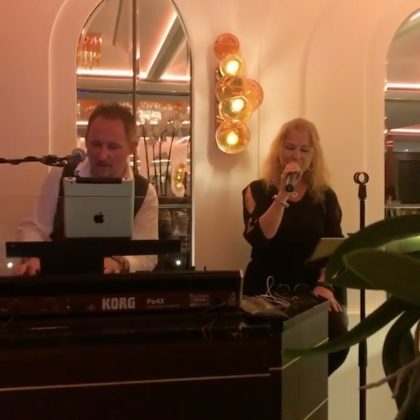 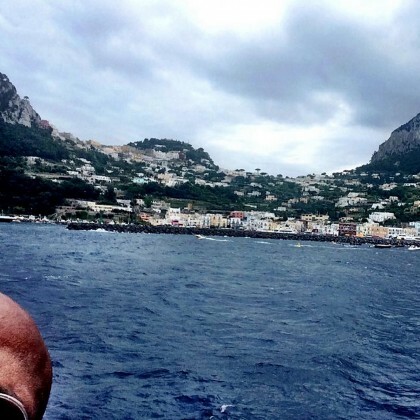 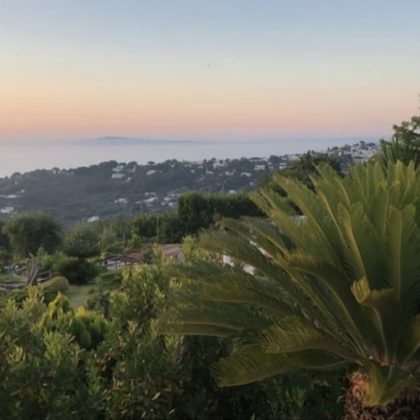 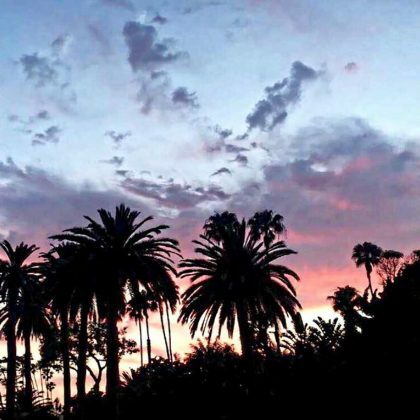 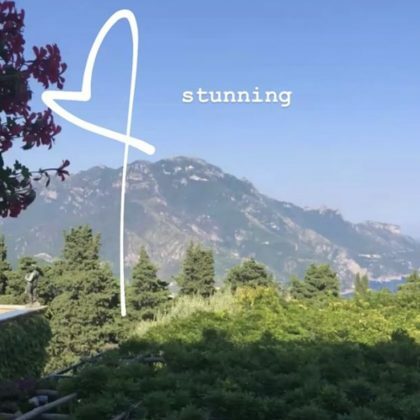 Rachel Zoe wished the “Happiest birthday to the love of my life my soulmate,” Rodger Berman, when the two celebrated at Le Stresa in September 2015. 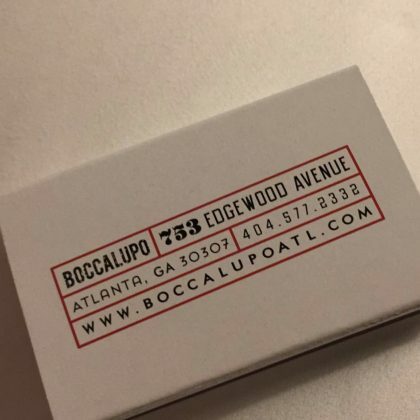 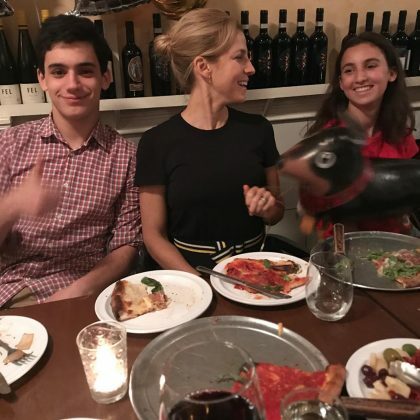 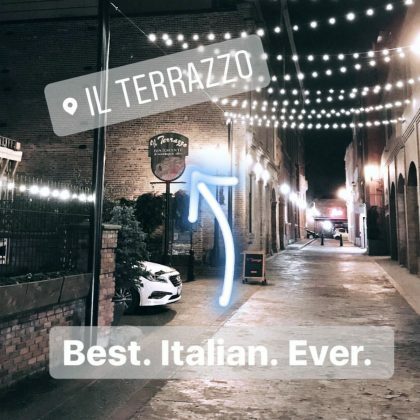 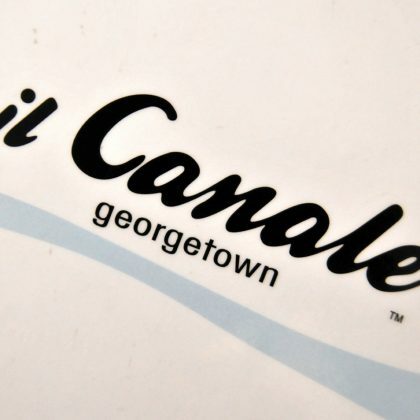 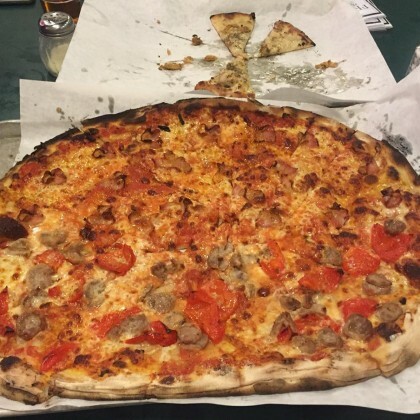 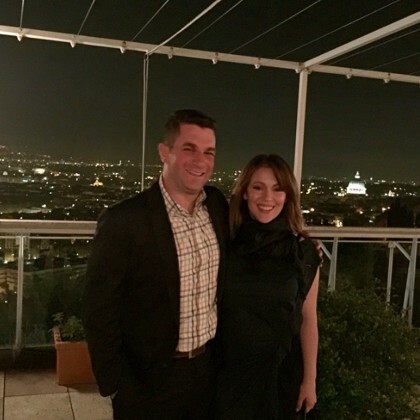 ﻿I asked ﻿Giuliana Rancic﻿ for a restaurant recommendation in the DC area in September 2015 and she said Il Canale has really “authentic Italian pizza” and that Georgetown’s got great shopping. 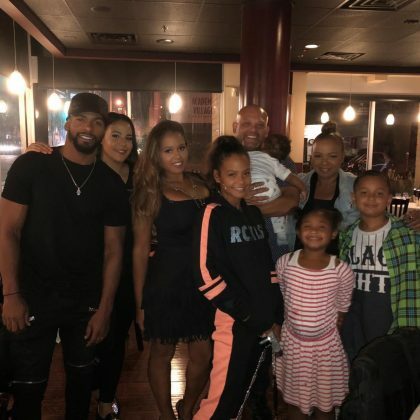 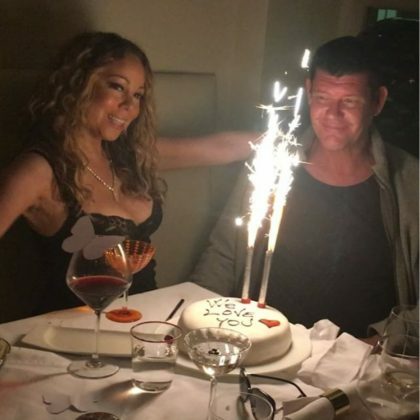 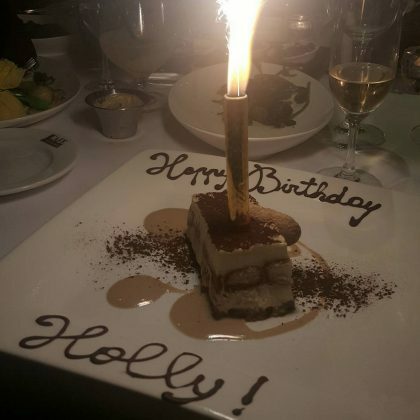 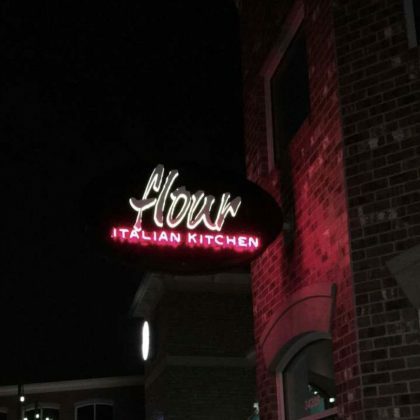 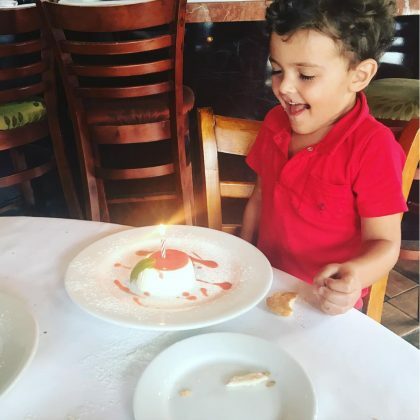 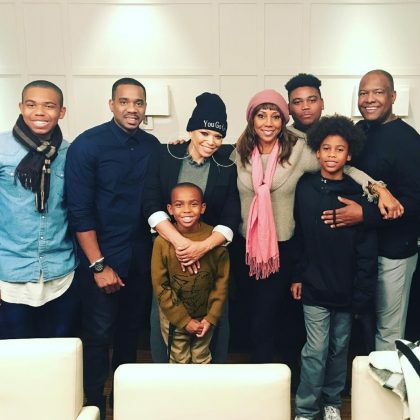 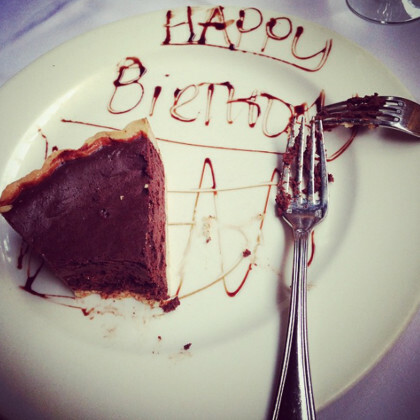 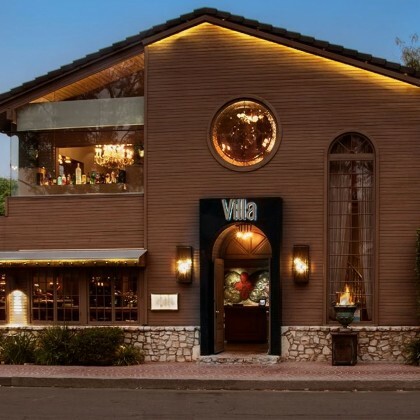 Holly Robinson Peete had “a robust and lovely birthday dinner” Cafe Milano in September 2015 that was capped off with a candlelit slice of tiramisu” ($13). 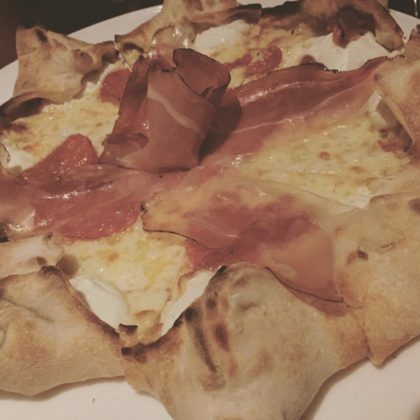 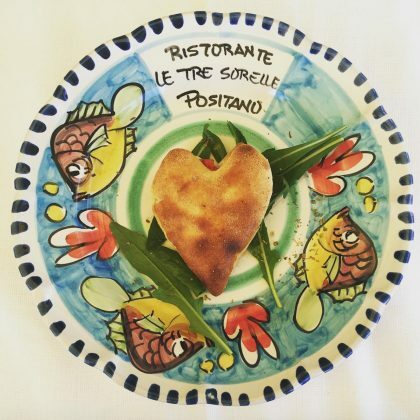 Lindsay Lohan sang the praises of the “wonderful Milanese” ($43) at Ristorante Frescobaldi London in September 2015. 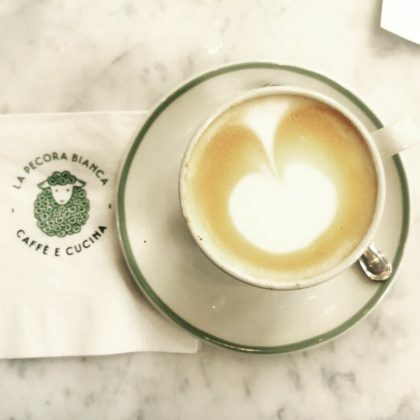 Kelly Rutherford﻿ came to La Pecora Bianca for some coffee in August 2015. 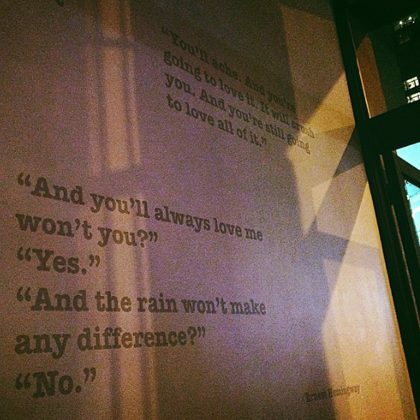 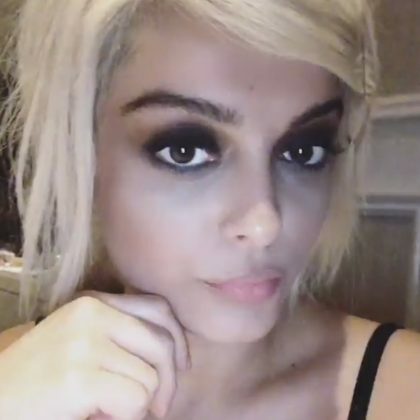 “Have you ever even?!? 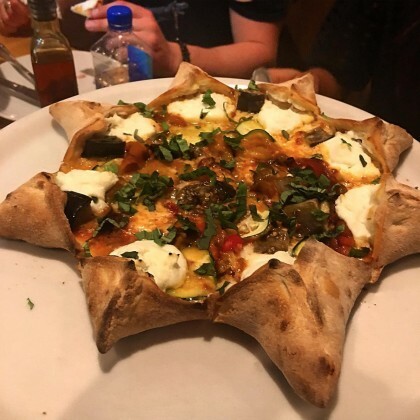 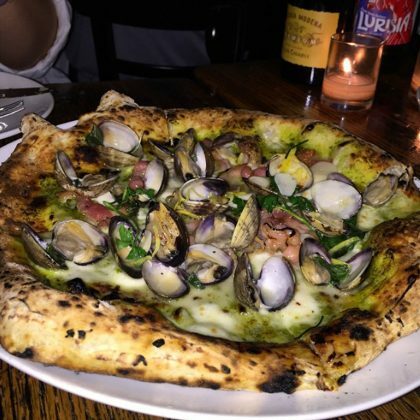 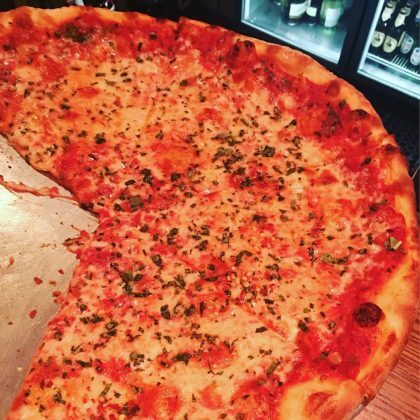 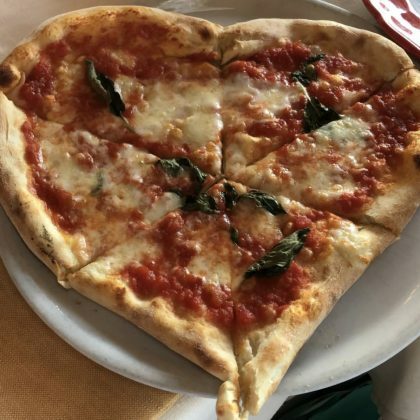 !” was all Whitney Port could get out about the star-shaped, ricotta-stuffed dolce “stella” pizze ($26) at Dolce Italian in August 2015. 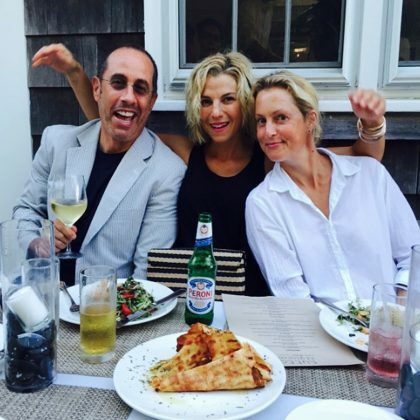 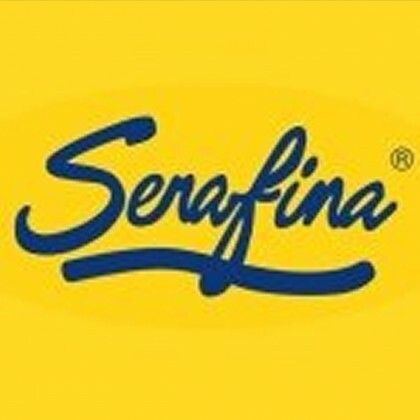 ﻿Jerry Seinfeld﻿ was checked in to Tutto il Giorno Southampton with ﻿Jessica Seinfeld ﻿in July 2015. 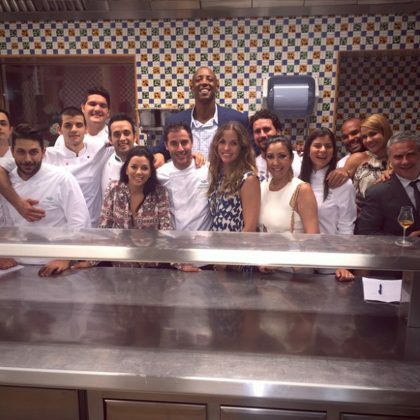 Eva Longoria said “Wow! 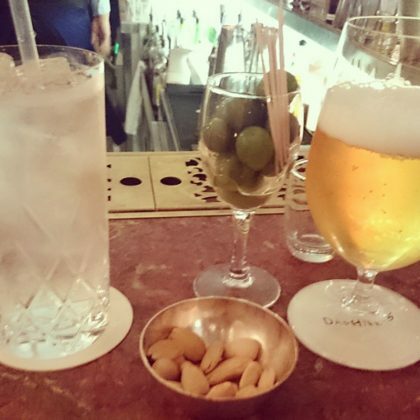 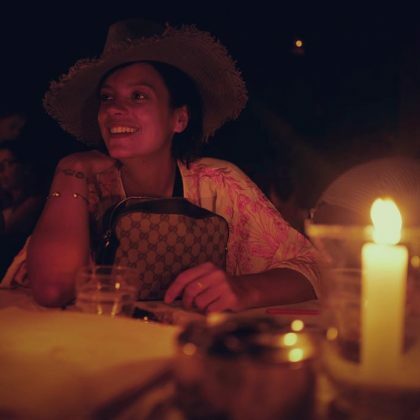 Amazing night at Don Alfonso! 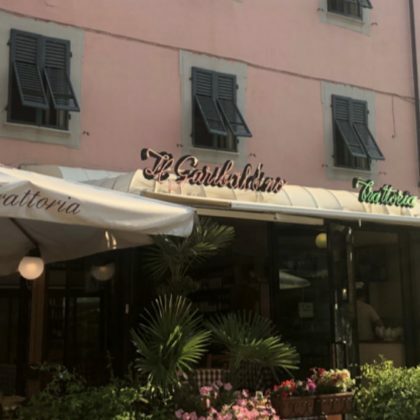 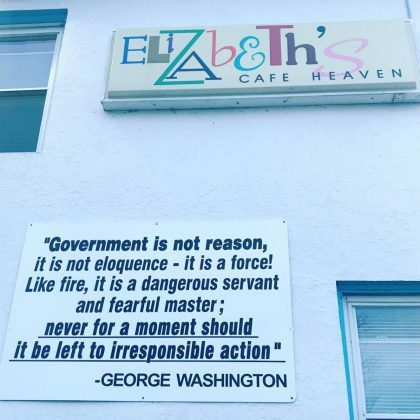 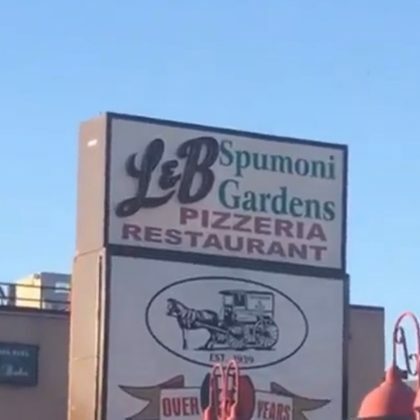 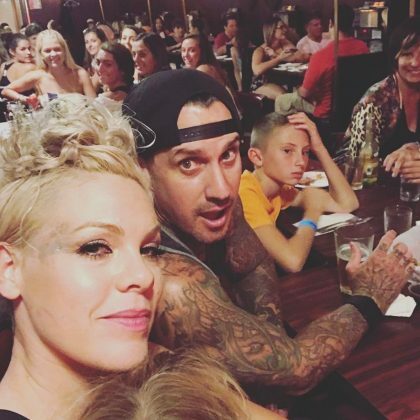 !” when she and her family and friends ate here in July 2015. 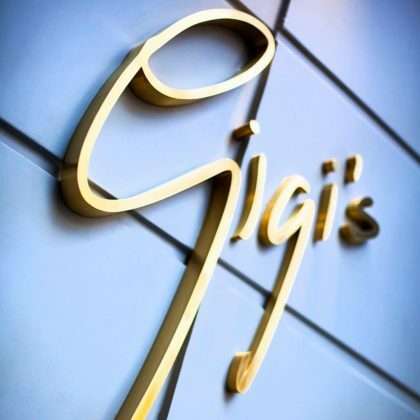 Lance Bass had a good feeling about his June 2015 meal at Gigi’s, saying, “you know a place is going to be amazing when they make your favorite drink to perfection!” He was talking about his espresso martini but went on to order “to die for” diver scallops ($37) and truffle tagliolini pasta ($27-$34). 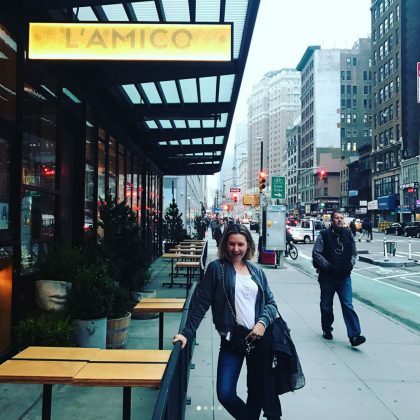 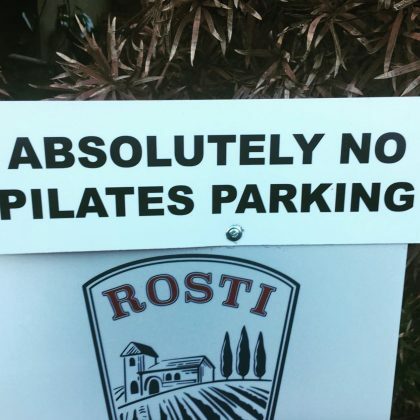 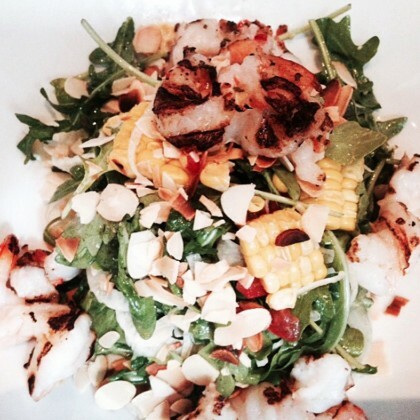 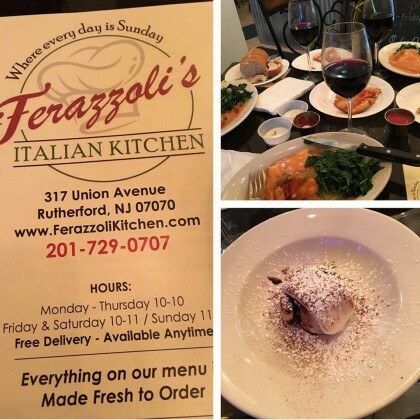 Lucy Liu described Zio Ristorante as a “Favorite” and ordered a “#rucolasalad w grilled shrimp” in June 2015. 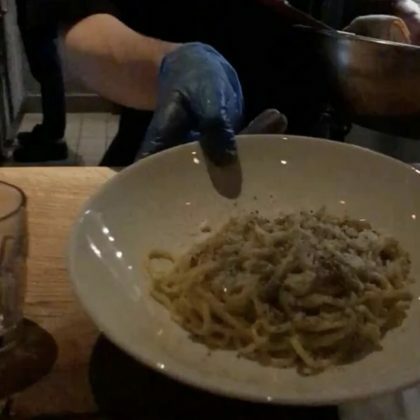 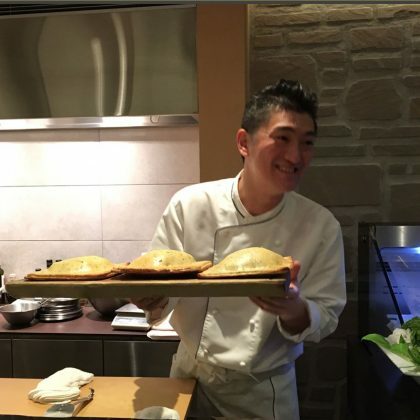 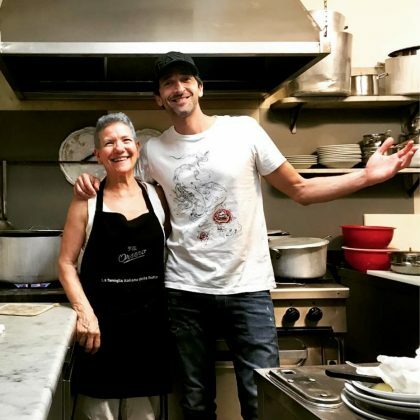 Daniel Dae Kim said he found “fantastic house made pasta and a nod to a certain TV show I know well” when he was there in May 2015. 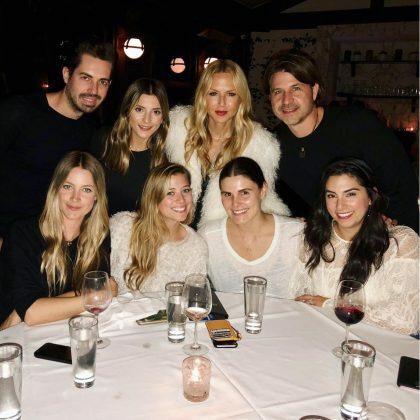 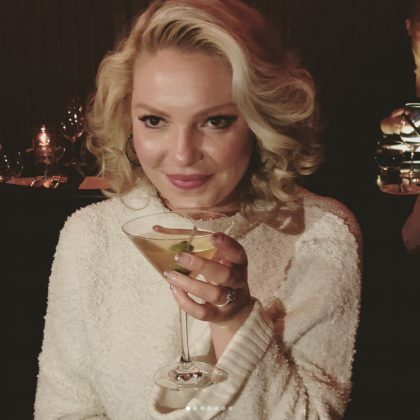 Stephanie Pratt grabbed a drink at the bar while “Waiting for the rest of the Shepherds” to arrive at their May 2015 “#LondonFamilyDinner” at Daphne’s. 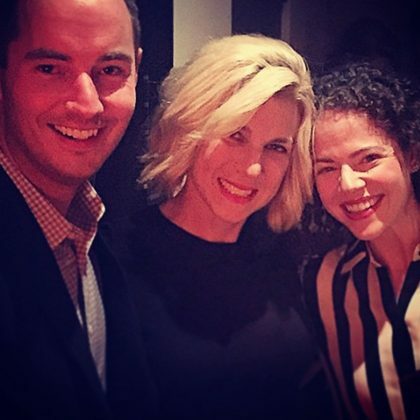 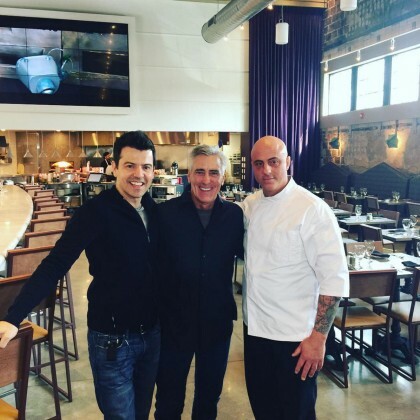 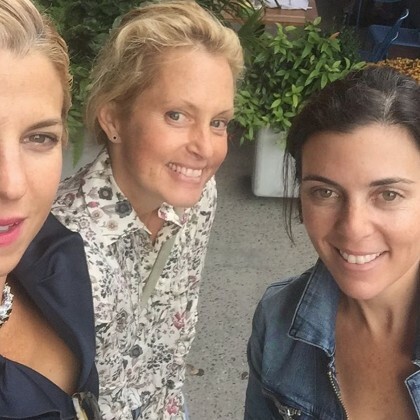 Jessica Seinfeld﻿ called Charlie Bird “my favorite restaurant” when she dropped by in April 2015. 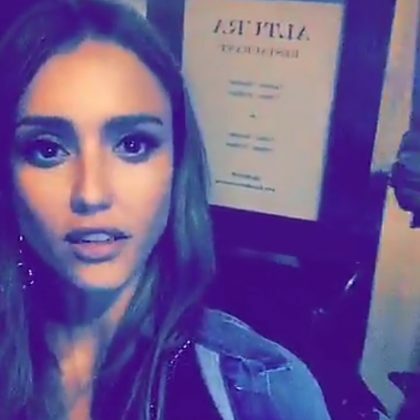 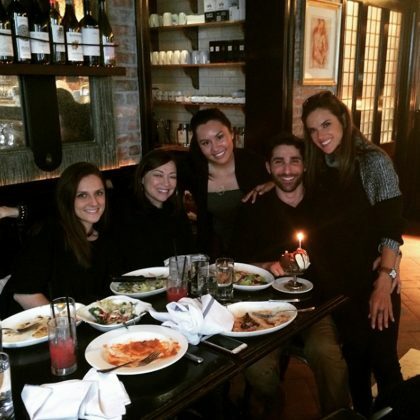 Alessandra Ambrosio attended a birthday “Celebration” for a friend at Laconda Verde in February 2015. 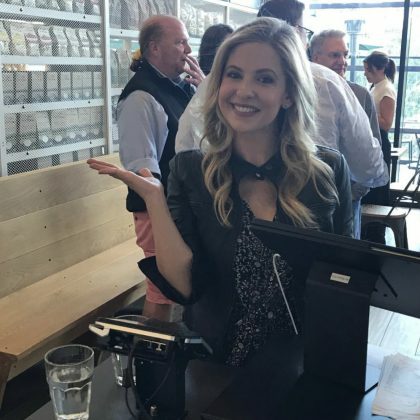 Melissa Joan Hart thanked the restaurant for hosting her clothing line’s team and “letting my kids run wild” in February 2015. 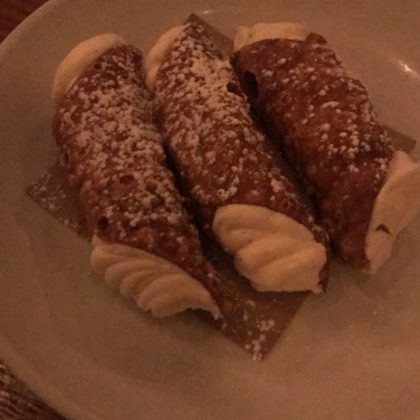 Martha Stewart﻿ was “On way to the Opera” when she was having dinner at “the festive” Lincoln Ristorante in January 2015. 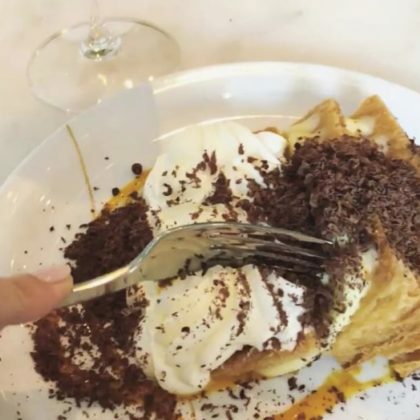 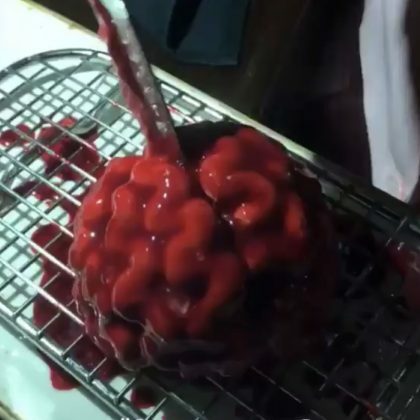 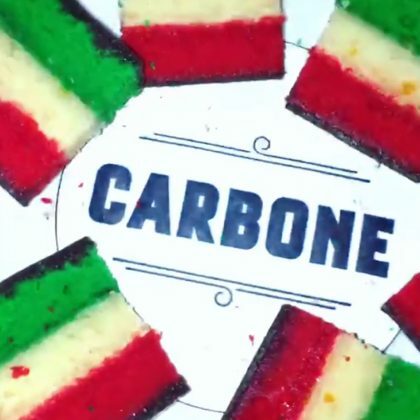 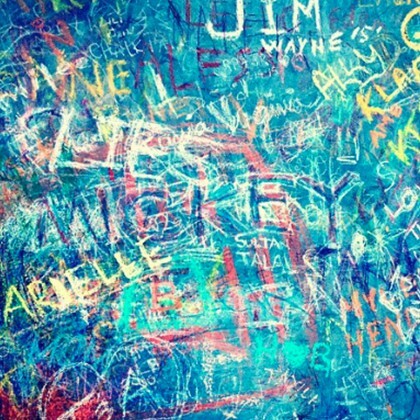 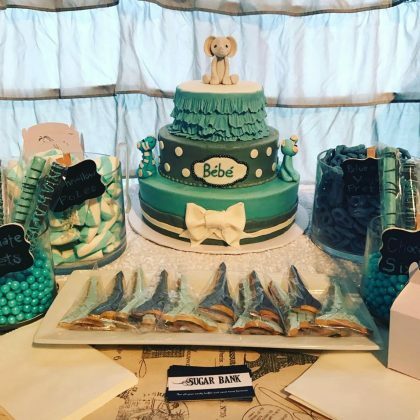 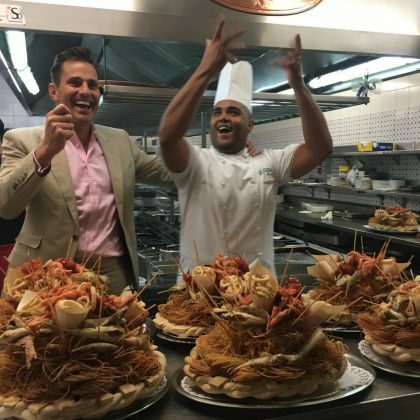 Lance Bass complimented the art-splattered cake this restaurant whipped up for husband Michael Turchin﻿’s birthday celebration in January 2015. 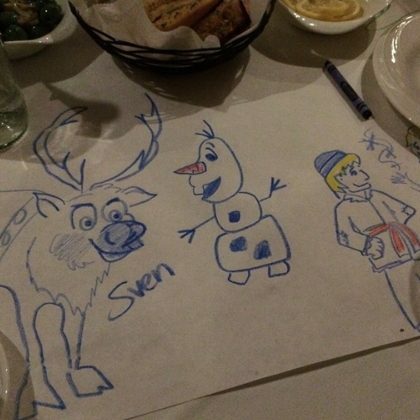 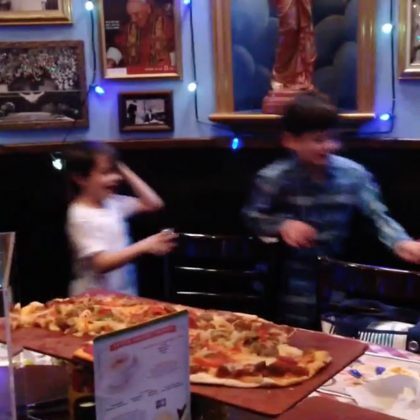 Holly Madison doodled some of the Frozen characters on her paper placemat while eating at Nora’s Italian Cuisine in December 2014. 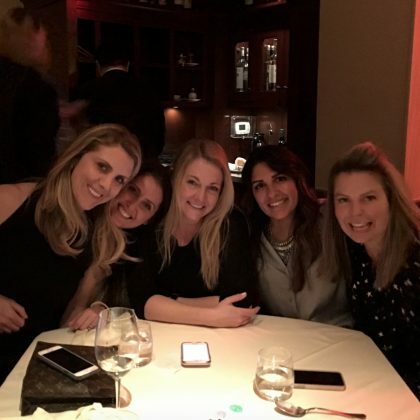 Nicky Hilton and Paris Hilton enjoyed some “sisterly love” while attending the 2014 Angel Ball here in October 2014. 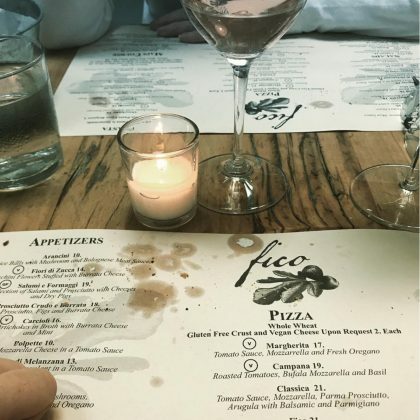 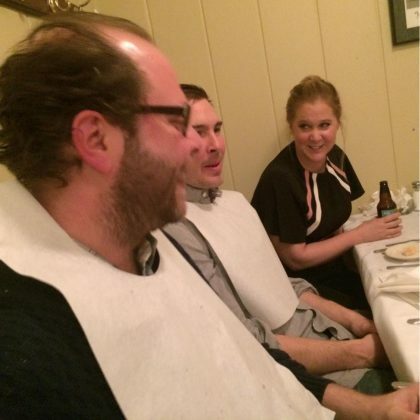 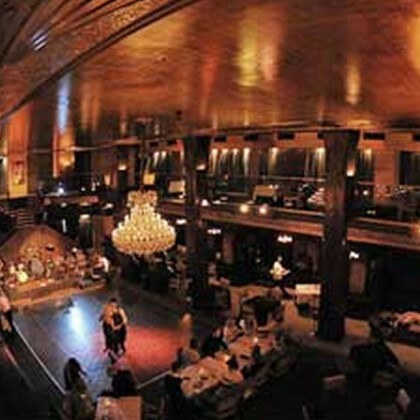 Lena Dunham said the “Bread shards at Tosca in SF” were here idea of a “#sexualfantasy” when she was there for dinner in October 2014. 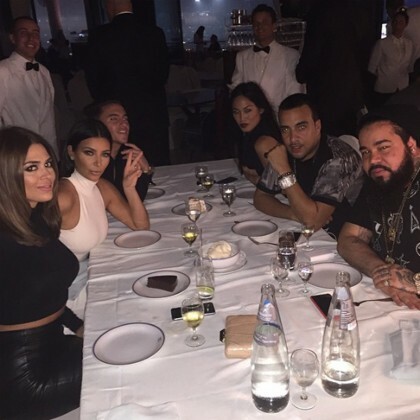 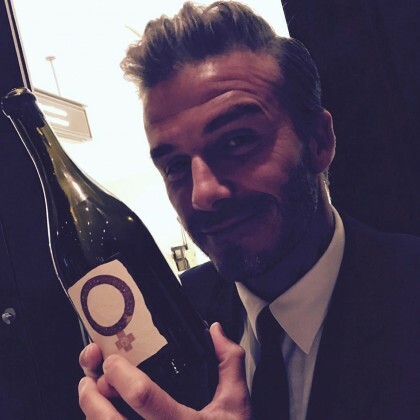 Kendall Jenner hit up Il Mulino Prime “after hours” in October 2014. 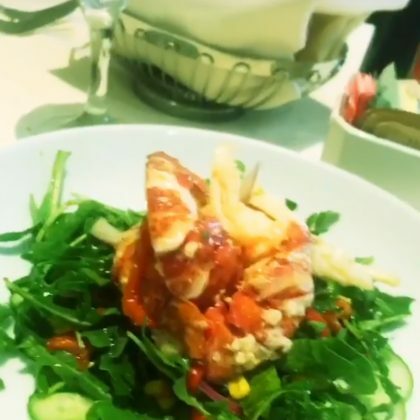 Cat Deeley﻿ dined on a “Langoustine Lunch” ($51) at E. Baldi in October 2014. 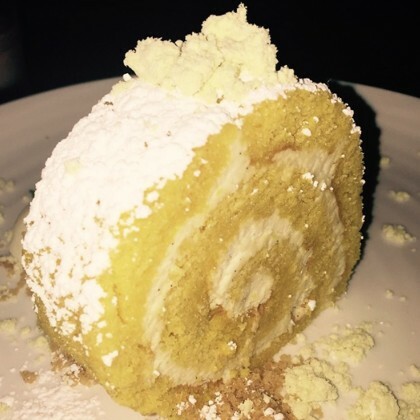 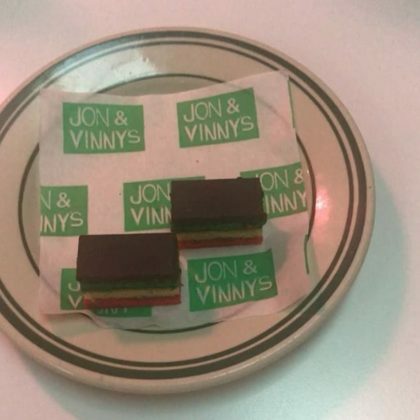 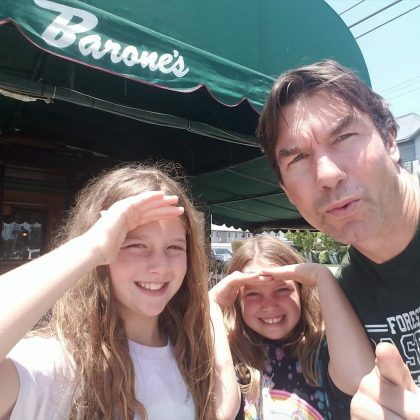 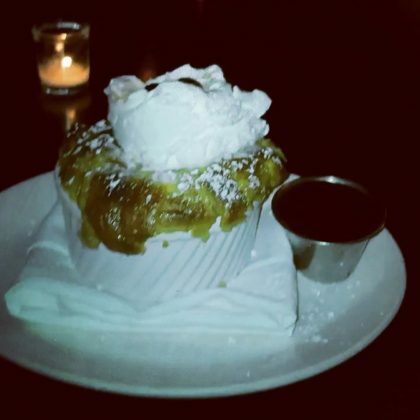 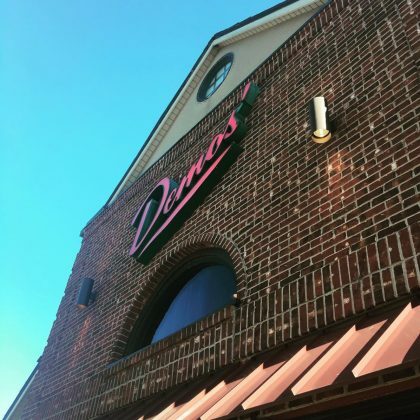 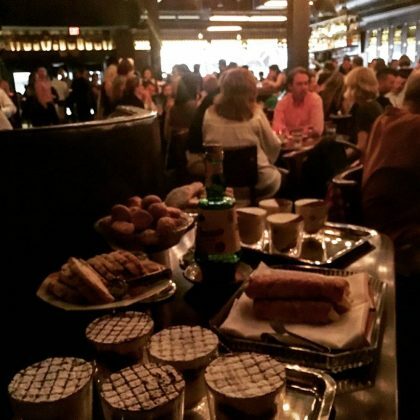 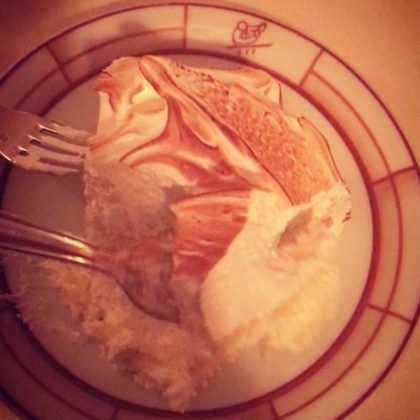 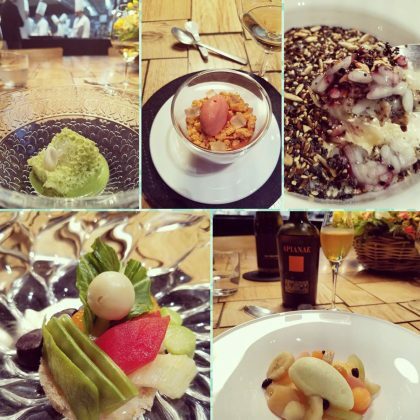 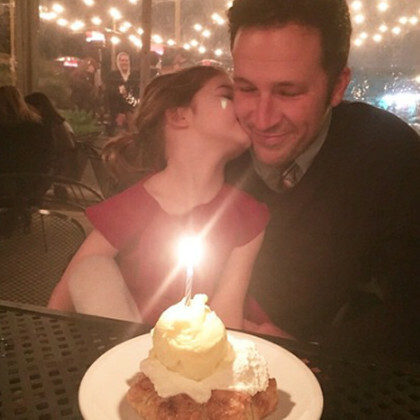 “Dessert done right” was Kevin Jonas’s to the point and powerful review of this place in July 2014.